It would seem our visit to Shanghai has been well timed as far as the weather is concerned at least. It’s a miserable morning of low cloud and drizzle. I can only hope our taxi driver is taking us to the south bus station as there is much conjecture and hesitation before setting off. It’s always difficult to know how much time to allow in getting to bus and train stations, especially in a foreign city the size of Shanghai. Guess work and a fair amount of contingency for unforeseen circumstances are required. The general formula is… the less time allowed equals heavier traffic. It always seems to be the way and this morning is no exception. We crawl along an elevated freeway for several miles anxious and cursing our optimism… or was it laziness. The traffic eventually untangles and we arrive at the front of what I hope is the south bus terminal. The driver flicks of his meter before we have time to swipe our travel card. Small disaster and definitely not required when running uncomfortably late. The driver asks for cash but we are wanting to use the remaining credit on our travel card so it doesn’t go to waste. He resolves the issue by flag falling the meter three times and swiping the card, which I’m sure is more than the original fare but at least we have used up the remaining credit. 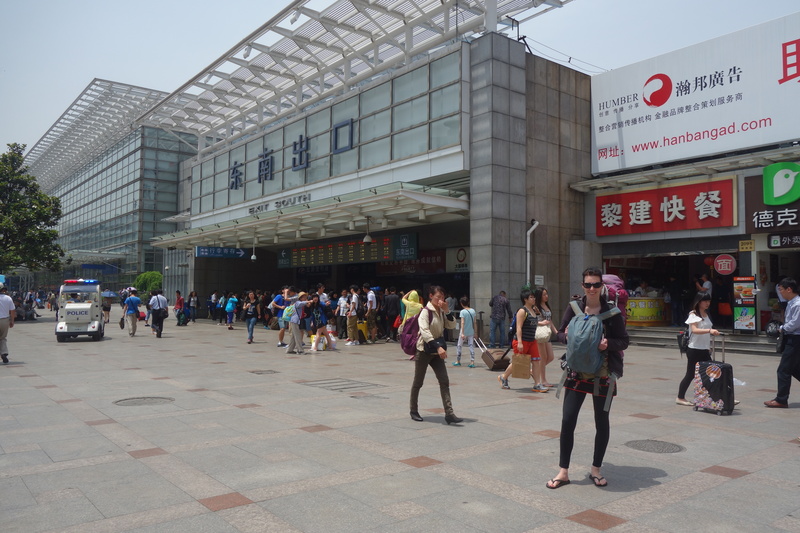 Our destination today is Tunxi a small Chinese city six hours south of Shanghai. Up until a week ago I had never heard of Tunxi. 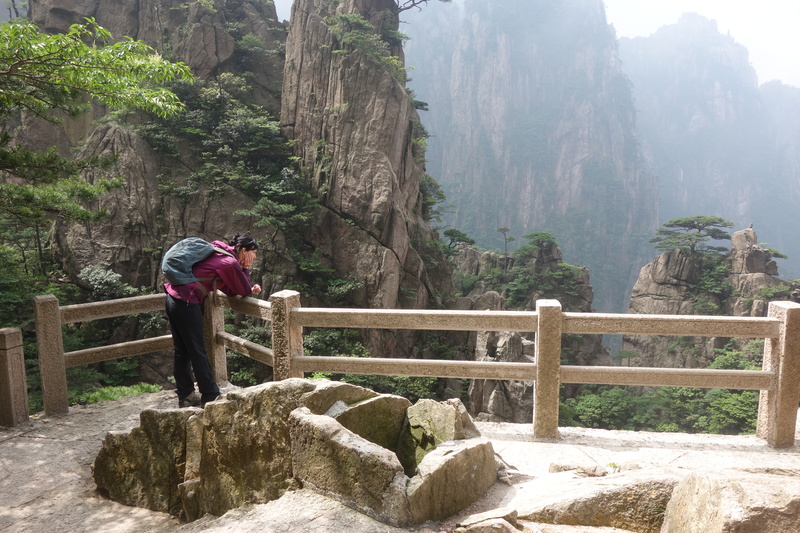 The reason for going here is that it serves as a gateway to Huangshan or the “Yellow Mountains” as they are translated in English. Most people outside of China have probably never heard of them either but they have been an inspiration for Chinese artists for centuries and as such present an iconic image of China. Seated next to me in the bus is a friendly fellow who has immeasurable bad breath. He can’t speak a word of English but he doesn’t let this linguistic hurdle prevent socialisation. I think what I like about the Chinese is that they don’t give up. Some of them will persist in speaking Mandarin expecting that you must know some words, or perhaps if I say it louder you will understand me. My chap today ranks among the best of them. I begin to understand what is must be like for a non-English speaker as we are by far the worst offenders. In a country where communication is limited I treat such exchanges as precious but I wish he smoked less cigarettes. I take out my guide book and open the section on Mandarin pointing to a few phrases. He takes the book from me and starts thumbing through the pages occasionally pointing and naming certain cities. He must think me an idiot as I nod and grin each time. I feel awkward so return speech in English which seems to amuse him. He points down to a bag between his legs and opens it. I peer inside and notice something moving in the dark. 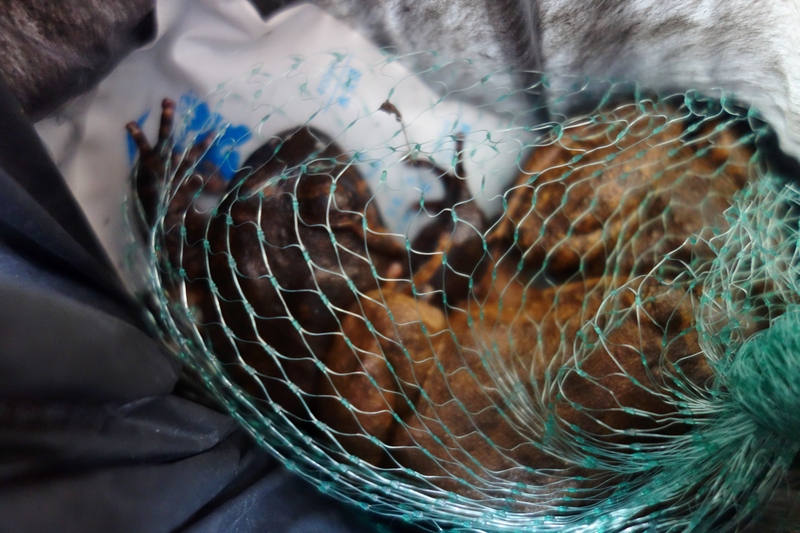 I open it a little further revealing five large brown toads. One of them is staring up at me and blinking. He laughs loudly pointing at me and then pointing to my stomach. Then starts patting and rubbing his own stomach and making sounds like a mother trying to convince a baby to eat. I think I may have identified the missing ingredient of his bad breath. I feel guilty about my thoughts of disgust as he is just a pleasant man being friendly to a foreign visitor. His ways here are correct. It would be like me inviting him back for a roast beef sandwich I suppose. I pat my own stomach gingerly with a pained face indicating illness and hope he understands. I’m just not ready for toad. By the time we have reached Tunxi a few hours later the rain has eased a little. My travelling companion picks up his bag of toads waves goodbye and disappears forever. Like so many others along our journey I shall never see him again. Such an inconsequential encounter but one I shall remember from time to time as an unrequired act of kindness on his behalf. The taxi drivers in Tunxi seem more willing to pick up foreign visitors than their counterparts in Shanghai which is a relief. The ride from the Bus Station to the old town costs 10 Yuan; a short distance of about 10 minutes. After surveying a couple of hotels we eventually get a room for 150 Yuan or $25.00 USD in the Old Street youth hostel. China is proving to be expensive when compared to her many neighbours. 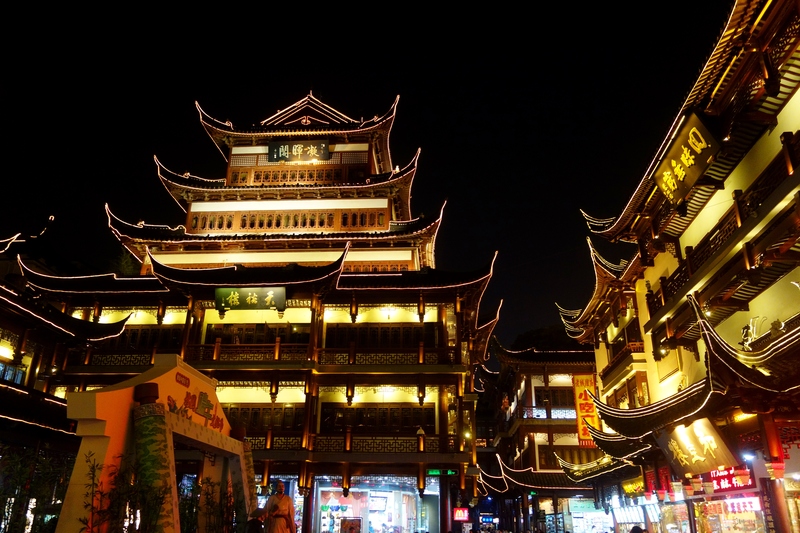 As implied the old town is where a collection of Ming and Qing dynasty houses remain. The street is lined with Chinese lanterns and makes for a picturesque scene. Strolling along the many shops I notice one that catches my eye. 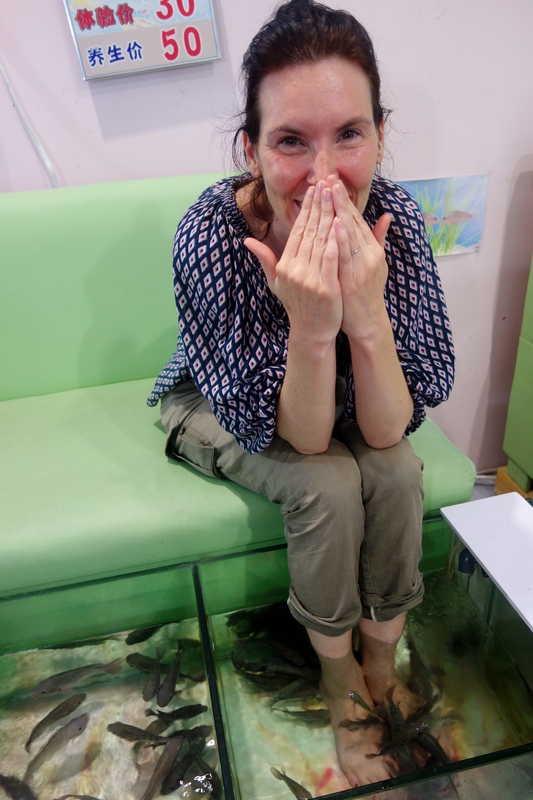 A line of people sat on leather sofas with their feet resting in fish tanks. A stout loud lady outside catches my interest and starts talking in Mandarin beckoning us inside. We follow her in and peer into the small tanks. Each one contains around 50 fish who are eating the dead skin off people’s feet. Some tanks have small fish others have medium and large fish. We are motioned to two empty tanks both containing… large fish. As we look down into the water they swim to the surface mouths open in anticipation. On the other hand I am unsure what to anticipate. Well you know what they say…No pain no gain. With some trepidation I plunge my feet into the hungry waters. The famished fish don’t waste any time and starting biting immediately. It is at first a very strange sensation and I doubt I shall last more than a few minutes let alone thirty. One fish who should be in the extra-large category carefully takes his time but delivers near fatal bites to my big toe. I expect to see the waters turn red with blood any moment now. Our presence in the shop has drawn attention from the many domestic tourists passing by, who much to my surprise seem equally squeamish. The owner seems to taunt them a little yelling and pointing to us. I imagine she is saying something along the lines of “even these foreigners are doing it, what is wrong with you”. The shop is soon filled with locals who are staring into our tanks and laughing. I contemplate what the word for commission is in Chinese. We leave the shop with clean feet and big toes intact and go looking for some dinner among the many restaurants. All this biting and nibbling has made me hungry. 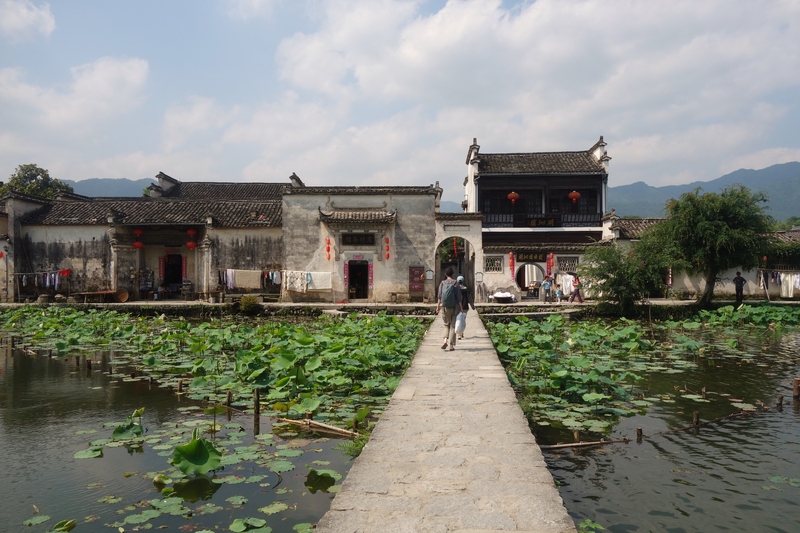 In between the Tunxi and Huangshan (Yellow Mountains) is the small traditional village of Hongcun, pronounced (Hong Schwan) as I am later to learn. Contained on three sides by a small river and backing onto a hill covered in forest it is well over 800 years old with many original buildings and ancestral halls dating from that period. 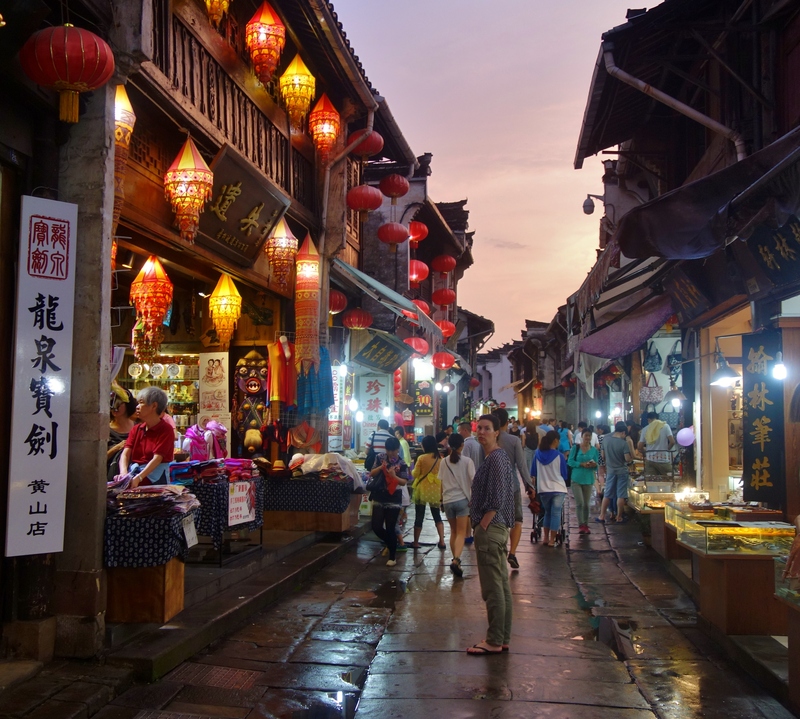 Unlike many other heritage areas in China this is a living community and not just a collection of tourist shops. 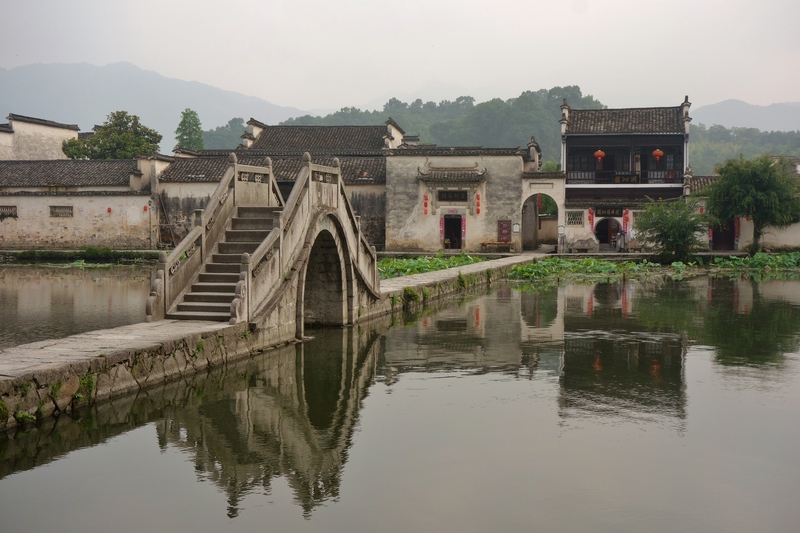 The elegant stone bridge that spans the river to the entrance of the village was used in the opening scenes of Crouching Tiger Hidden Dragon. Walking the through the narrow streets is like stepping back in time. 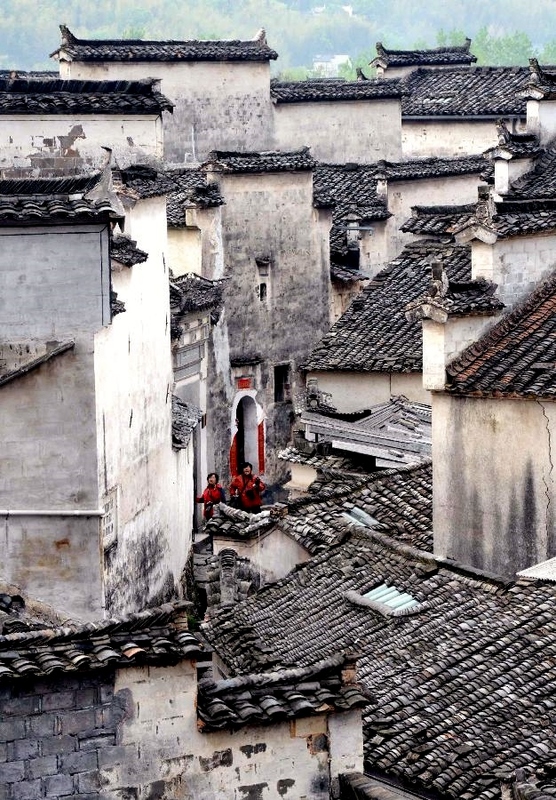 The buildings are white washed plaster with dark and ancient Chinese tiled roofs, sloping and curved with upward pointed ends. This is fairy tale China… just how you imagined it should be. We find accommodation with some ease given the many houses that have been converted to small hotels and homestays. One lady shows us a wonderful room with a view of the bridge but 300 Yuan is more than we are hoping to pay so we take the downstairs room for 180 instead. That night she cooks us a simple but tasty meal of fried pork with tomatoes and peppers and some steamed rice with a little chili. Hidden in the tight lanes we discover during a night-time stroll an old hall that has been tastefully converted into a coffee shop. The sign outside says “best coffee in town” and given its size this seems highly possible. Such a claim must be investigated. The owners are American Chinese who live in Seattle but spend almost half their time in tiny Hongcun, which is not difficult to understand. They also make delicious waffles with chocolate sauce and milkshakes. Feeling full from dinner we return the next morning for breakfast. I am embarrassed to say that after being introduced I forget to write down the owners name and now can’t remember it, which is unfortunate as he kindly offers to drive us one hour north to Tangkou at the base of the Yellow Mountains. We thank him at first and politely decline but after hearing we will have to wait over three hours before the bus goes we take up his offer. I wish I could remember his name but I can’t. All I can say is, if you are ever in Hongcun make sure you pay a visit to the Granary for without doubt the best coffee and waffles in all of ancient China. When we arrive at Tangkou there is no sign of the pine clad and misty peaks that feature so heavily in Chinese art, just a rather ordinary small city. 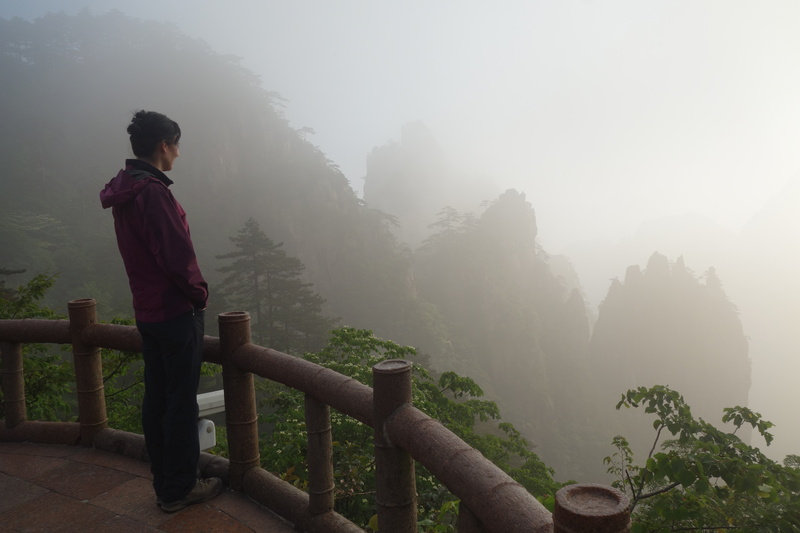 The entrance to Huangshan Park is so far revealing little. Taxis and cars are not permitted in so we part farewell to our unnamed barista and take one of the blue park busses another 8km up to the start of the Eastern stairs. The entrance fee is as steep as the stairs to the top (of which there are many) 260 Yuan each nearly $45.00 USD. We begin the 7km ascent rising over a 1000m in elevation in warm cloud. An hour later and the temperature has noticeably dropped. The clouds and mist clear a little giving us a glimpse of the stunning cliffs and landscapes. There is no indication as to how far we have come but we continue up the unrelenting stairs feeling surprisingly good. I think Nepal and Tibet are still paying dividends as we pass many fatigued and worn out souls. We reach the top of White Goose ridge in just under two hours, just in time to see dense grey cloud settle over the mountains blocking any views. Just as well that we have planned to stay two nights at the top which is highly advisable if you don’t want to be disappointed. There are several large hotels located on a few ridges on top of the mountains. All seem to have signs giving directions except for ours. Most of the signage is in Chinese as you would expect so I should be grateful for the odd hint of English even if it’s more confusing rather than confirming. We head towards to the West sea Canyon and come upon the Xihai hotel. Try pronouncing that to Chinese while searching… it goes something like (She High) which I later discover means West Sea. Anyway the rooms are very good but the food is terrible and overpriced. The coffee shop that looks so promising never opens during our entire three day stay but none of this really matters, it’s the views we have come to see. But I do wish I could get some of that fried pork and waffles from Hongcun again. The next morning is greeted with dark cloud and disappointment but we head out early into the gloom regardless. Gathered at the edge of a vast void of grey is a small group of optimistic types hoping the cloud will lift. Huangshan it seems is a place of tolerance and patience so we wait anyway slightly disgruntled. One Chinese man says hello to us. His English is excellent, turns out he is from Ashfield in Sydney our home city. Our patience is rewarded the sun burns through the cloud to reveal wonderful views in the morning light. The valleys are filled with fog, the peaks are veiled in mist as far as you can see. No wonder this scene is depicted on the back of the 5 Yuan note. Twisted and abnormal shaped pine trees cling to the steep peaks with such names as…Flower blooming on a brush tip, Beginning to believe, Purple cloud and the rather out of place and more recently named Mobile Phone peak. We descend lower into the west sea canyon on a stone staircase that clings to the cliffs; dropping ever deeper into a dense green almost prehistoric chasm. 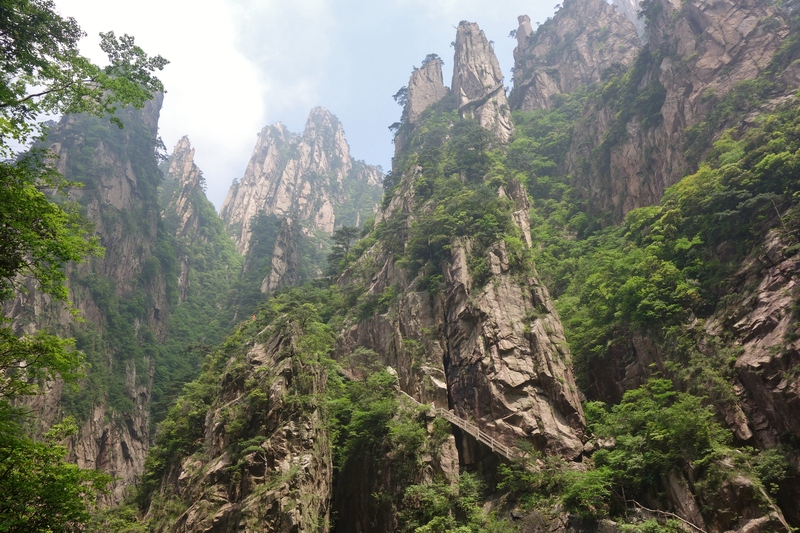 Towers of rock rise high above with huge boulders resting in precarious positions. One such structure is named the camel for obvious reasons. The western stairs are twice as long as the eastern version and although feeling fit and strong I am glad when we finally reach the bottom that we are not going up. We pass people who are either masochistic or completely ignorant as to what lies ahead. I genuinely feel sorry them as many look ill prepared and simply not capable of such a strenuous ascent. 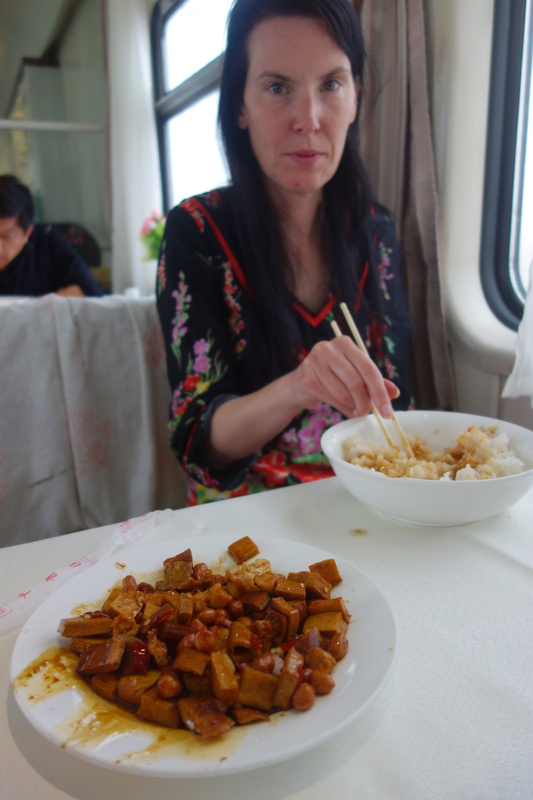 The Shanghai Express departs Lhasa shortly before lunch on a Monday morning but despite the swift name implied we won’t see Shanghai till two days later on a Wednesday afternoon. 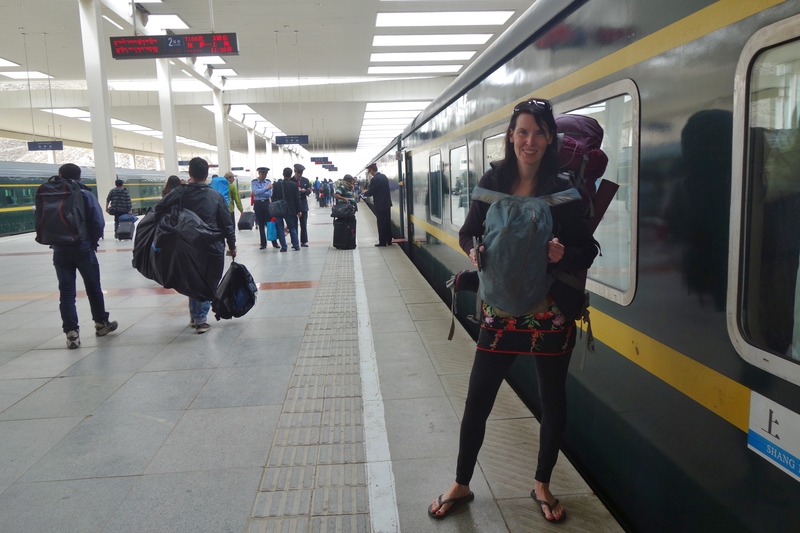 I suppose to be fair we do have to traverse over 3600km and the world’s highest rail pass. I can only be grateful that such a journey is not being embarked upon in a bus. It will be to date the longest and most economical segment of our trip. To cover as much ground in any of the other countries we have travelled through would have taken a week and possibly longer. At the end of the carriage is an electronic board that shows our current speed and altitude. I can’t think of too many trains that display altitude but then again this is no ordinary train. The Tibet Qinghai railway is the highest train line in the world, rising to a height of over 5200m or around the same height as Everest base camp. The carriages are supplied with supplementary oxygen to aid the many passengers who suffer from the rapid climb into thin air. 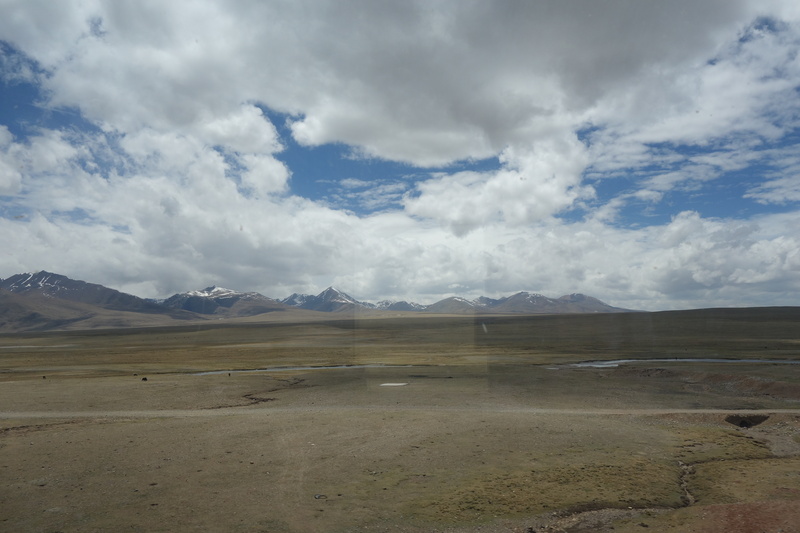 The Tibetan plateau is bleak this afternoon. I think at first the dull ceiling of clouds above to be low in the sky but then I realise its more that we are high. The jagged mountains are gone now with only a few small hills making any impression on the surrounding plains. Having said that, these small unremarkable summits are higher than any peak in the Alps or Rockies. Grazing by the tracks is a vast army of yaks. They watch with little interest as we pass, chewing on sparse patches of grass. Beside us I can see a marker on the road that reads 3391…3391km to Shanghai. It seems so far, can we really get there in two days. Our current speed suggests otherwise but we are after all going uphill. Eventually we climb so high that even the clouds must surrender to the land. Outside its dark and grey and it begins to snow. I would like to say it’s beautiful but there is little visibility. I can still make out the occasional yak and a few trucks crawling along the wet road that runs beside us. I start to make more regular trips to the small video screen and note 5208m. I wait for some sort of official announcement that we are now cresting the highest section of track in the world… but none is given. Fifteen minutes later we are at 5150m so I guess the big moment has come and gone. I think the People’s Republic of China has missed an enormous opportunity for propaganda here and quite frankly I am a little surprised. As the sun goes down we make our way to the dining car. It might all sound very civilised until you discover there is no one who can speak English and no menu to order from. We take a seat and survey the plates of food being consumed around us. One girl is sucking dimpled skin off a chicken’s foot and spitting the refuse into a tissue. Another man is slurping some type of soup with unknown floating objects. I can see another dish of something but am unsure of its origins. This is certainly not the Chinese food you come to expect at home. The hardboiled egg containing a chicken embryo is certainly out. Finally I spot a dish that looks familiar. It appears to be stir fried pork with red and green peppers. We order two plates and some boiled white rice which we season with brown vinegar provided. When the pork arrives it has the added benefit of some cashew nuts added which is a pleasant surprise but also comes with something else that looks to be fried pig skin. Fortunately we are able to pick out the unwanted items with our chop sticks. The locals seem to find it surprising and amusing we can use them. One chap smiling picks up a serving spoon and starts showing us he is able to use our implements as well. I congratulate him with a smiling nod and continue to remove the pig skin from my dinner. Certainly there is no chance of getting fat on this trip. It’s been many months since we last slept on a train. I think the last time was on the way to Bodhgaya in northern India. While falling asleep I notice that the trains in China are much quieter than those in India. That familiar clicking and clacking of wheels is missing and the rails are so perfectly aligned that there is little movement in the carriages. Inside the passengers are much quieter as well and while this is a blessing I do miss the always affable but noisy Indians. The next morning and I draw open the curtains to uninspiring landscapes. Semi Industrial scenes and eroded hills lacking any colour. To make matters worse we are now in a depressed channel with embankments on both sides affording occasional glimpses of the surrounding mediocrity. It persists for most of the day and by late afternoon I am convinced that this part of China at least has to be one of most disappointing regions in the world. I can only hope that Day 3 will provide better results. It doesn’t! An hour before arriving into Shanghai we thankfully have some exciting moment in geography and cross the third longest river on earth. The Yangtze is only marginally shorter than the Nile but is much wider. It appears to be half a mile from one bank to the other. Like us it started its journey up in the Himalayas. It’s a significant moment to sight this huge river for the first time. Shanghai is the eastern most point on our entire journey. The long path to the Pacific Ocean that started almost a year ago in Turkey is over. I can recall that afternoon so well when we left Adana on a bus, travelling east through fields of tulips. It all seemed so far away then with so much time left. Now I am reminded that our trip is getting closer to the finish. From now on we will be travelling in a southerly direction down through south East Asia to Singapore. We disembark into a world completely different from the one we left 50 hours ago. The first thing that strikes us is the heat and especially the humidity. We exit the station amid towering apartment blocks and dense traffic. It is at first very disorientating and remains so for some time. It’s bizarre to arrive into a city this size as a complete stranger who can’t read signs nor speak the local language. More so is that unlike other countries, most people here can’t speak our language and are generally not interested in doing so. I think as an English speaker we are normally given the luxury of others speaking English for us… but here in China that does not happen so much. We hail a taxi and say Nihao, which is Hello in Mandarin. I then ask Nanjing Rd, which is the central retail area in Shanghai and close to the hotel we have booked. It’s like saying Time square in New York but the taxi speeds off with no attempt at trying to understand. This happens another six times. What is going on? One driver waves his hand rudely and motions for us to move aside and let another man get in, which he does without hesitation or the slightest regard. This has me desperate and fuming. There is nothing else to do but go across the road to McDonalds and regroup. After two days of eating white rice and picking out pig skin from our meals we are ready for a Big Mac. It will be in fact my first since leaving Egypt and a much awaited experience after the disappointments in India where only a poor poultry version was provided. It might seem odd but being here while lost in a foreign city consuming familiar food in air-conditioning is like a sanctuary. The culinary foreign embassy of the golden arches. One of the girls serving is able to speak a little English, so we ask if she can write in Mandarin that we want to go to East Nanjing Rd. She writes down our request on the back of the sales docket. Having fed and rested we pick up our bags and enter the fray now armed with a desperate plea scribbled on a fast food receipt. A few taxis reject us before we have time to show them the message but the next driver is pleasant and patient enough to take the message and read it. He smiles and motions for us to get in. 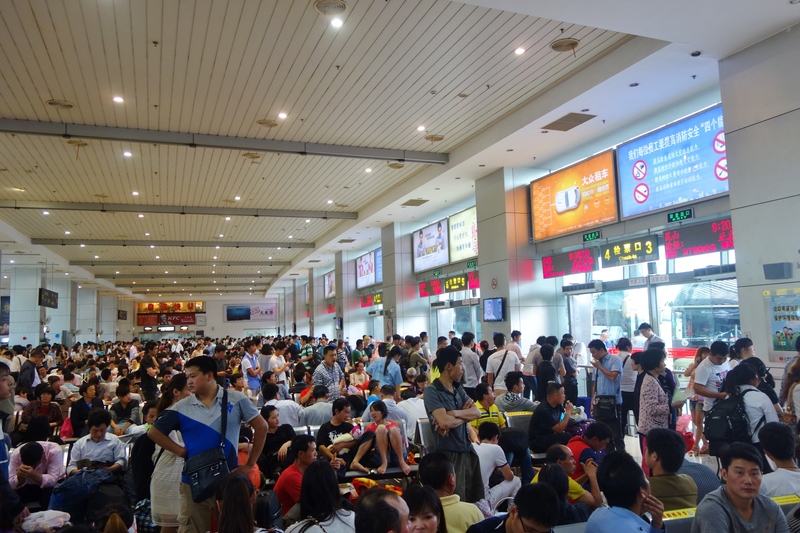 It’s a huge relief but it does leave me wondering about just how difficult travelling through the rest of China will be. 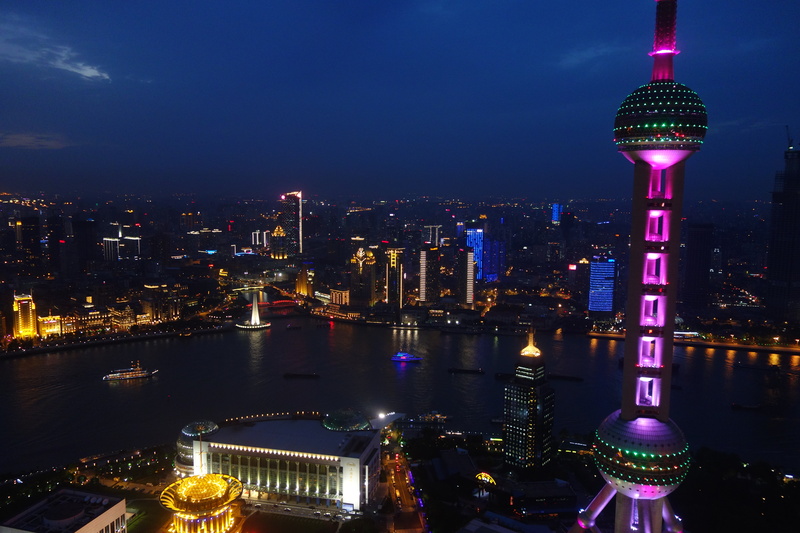 Shanghai used to be described as the Pearl of the Orient and the Paris of the East. A bustling metropolis of bright lights, jazz bars, opium dens, and prostitutes. It was a magnet for those seeking opportunity and fortune. Modern Shanghai has replaced the opium dens with night clubs and removed the Union Jacks that once fluttered over banks along the Bund but the rest is the same. 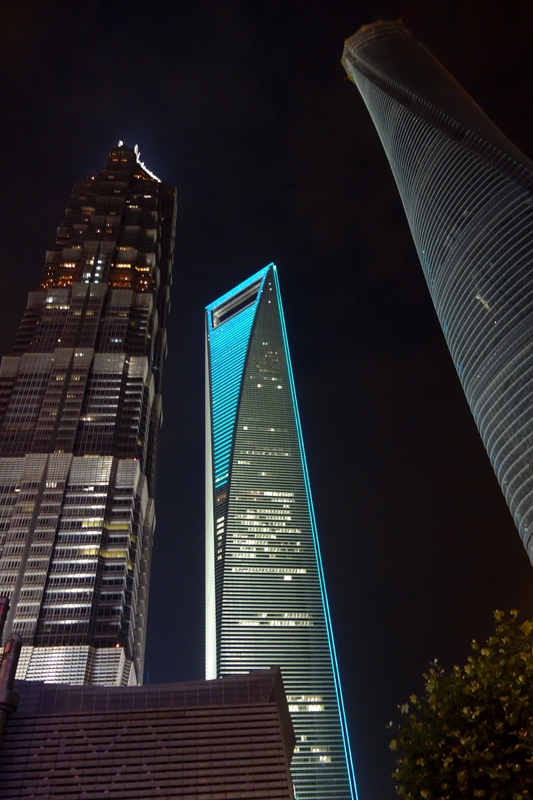 Shanghai is making a comeback and experiencing a renaissance. There can be no doubt this is an exciting city, a happening city. 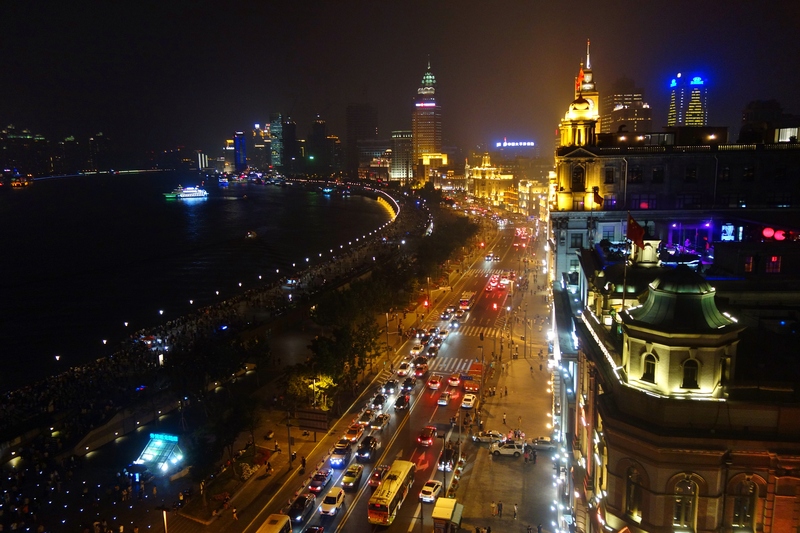 The Huangpu River is flanked by the elegant buildings of the past on one side and quite possibly one of the most beautiful and dramatic collection of Skyscrapers the world has ever seen on the other. It’s a striking opposition of past and present dressed in dazzling lights. It’s difficult to conceive that we are still in a Communist country where the only reminder is the red flag of China flying over old colonial buildings. It looks very much out of place among all this decadence and commercial glamour. I wonder what Chairman Moa would think of his China now. Our thoughts are to celebrate in style and so the daily budget is slashed and abandoned which is just as well as drinking in Shanghai doesn’t come cheap. 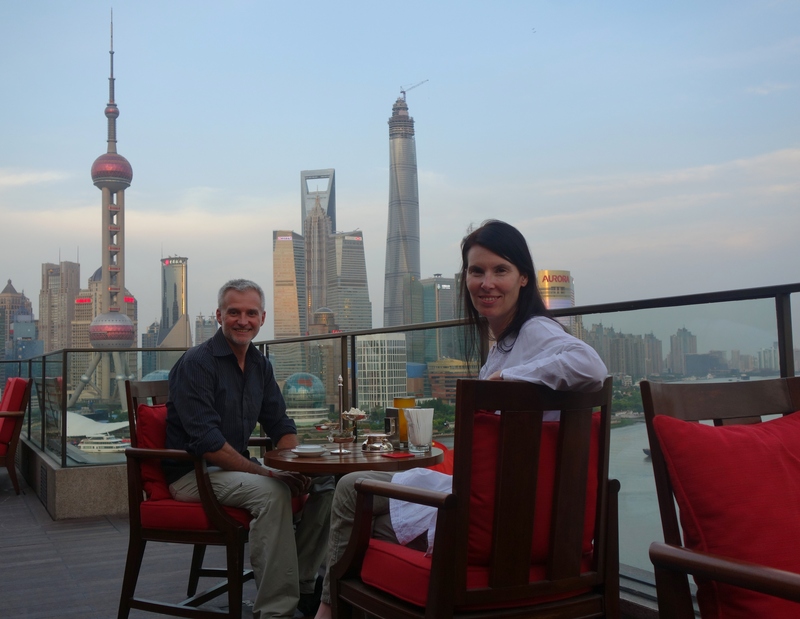 Almost every building on the Bund has a roof top bar affording superb views of the city. We start off at the Peninsula, then move across to the Ritz Carlton in Pudongbefore eventually finishing off at the Grand Hyatt. 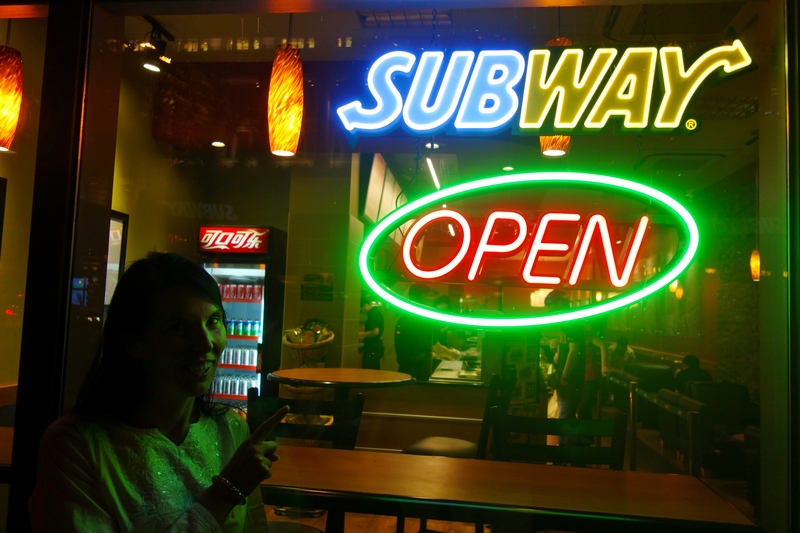 In one debauched evening we have spent over a week’s budget on cocktails and Martinis which is why we end the night for dinner at Subways. Any foreigner wanting to see Shanghai must leave their hotel armed with an essay of requests written in Chinese or you can master the metro which we undertake the next morning. The taxi situation is futile and annoying. Once it gets dark they refuse regular fares and insist on vastly inflated prices and that’s if you’re lucky. Our attempts at purchasing tickets are also futile as the screen is completely in Chinese. Then we notice hidden in small print at the top right hand corner English. We touch the screen and the metro map is converted to recognisable characters but it’s still puzzling and confusing. By now a long line or cranky Chinese is forming behind us. I can feel panic and terror setting in. It’s no use asking for help and we just stand aside feeling defeated. But there is one last chance. I remember reading about a travel card that can be used on busses, taxis and the metro. If we can purchase one of these we won’t need to buy a ticket each time we travel. I open our guide book to the section on travel card which conveniently is also written in Chinese. I point to the page and ask a few locals where I can get one. Ignored several times we persist until one lady point us around the corner and down a flight of stairs. I point to the picture of the travel card and request two by holding two fingers then take out a two 50 Yuan notes. She seems to understand and you might think me condescending for being surprised but I have come to find that the Chinese are rubbish at playing charades. Life in Shanghai just got a whole lot easier. Now with just a single effortless swipe of a card we can go anywhere we please on the metro which I have to say is excellent and easy to navigate. Later that night we spend another week’s budget on drinking and nightclubbing before dinner at McDonalds. It’s a pattern we seem to follow for the next few days. Sightseeing during the day followed by drinks in lavish hotels and cheap fast food dinners… although the amounts spent are greatly reduced owing to fear of bankruptcy. Without doubt the most stylish and certainly historical residence for any guest is the Peace Hotel. 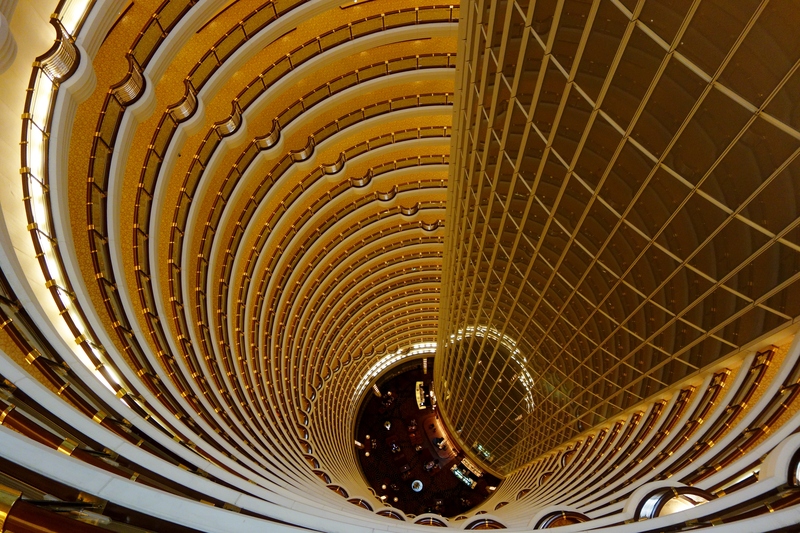 It is to Shanghai what the Ritz is to London or the Waldorf Astoria is to New York. Recently restored and reopened in 2010 it’s a masterpiece of Art Deco. Once inside the foyer you step back into the heyday of 1930’s Shanghai. Jazz and swing music waft through the corridors like ghosts from the past. It’s easy to be transported back in time. I guess that’s what travel is all about. To find yourself in a different place and even in a different time. If time and especially money were of no concern I should want to stay longer in Shanghai, but we must as is so often the case leave a place we have become accustomed to. We leave Shanghai behind and head south towards the Yellow mountains and onto another great city of the world…Hong Kong. When we first reached Kathmandu at the end of February the capital was still blanketed in late winter fogs and a cold breeze persisted during the day. It’s now the middle of May and the city has begun to swelter. 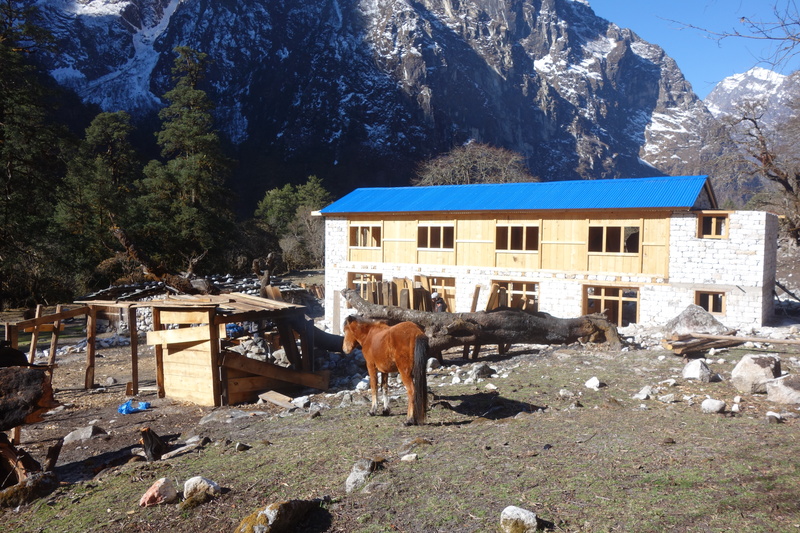 The spring trekking season has come to an end and only a trickle of tourists now remain. The summer monsoons are not far away, but we are still here waiting for our Tibetan permits and Chinese visas to be approved.Crossing the Himalayas into Tibet and China is our only option if we are to reach Singapore without flying. We must go north. The east is blocked by Burma which currently has no border crossings open. So it is with much relief that we finally receive the good news of our approval from Pradip. It has taken a couple of weeks longer than expected and put us behind schedule but our path to Singapore seems finally clear. This was possibly our last great concern, from a visa point of view at least. For the first time I begin to sense that we are going to make it. 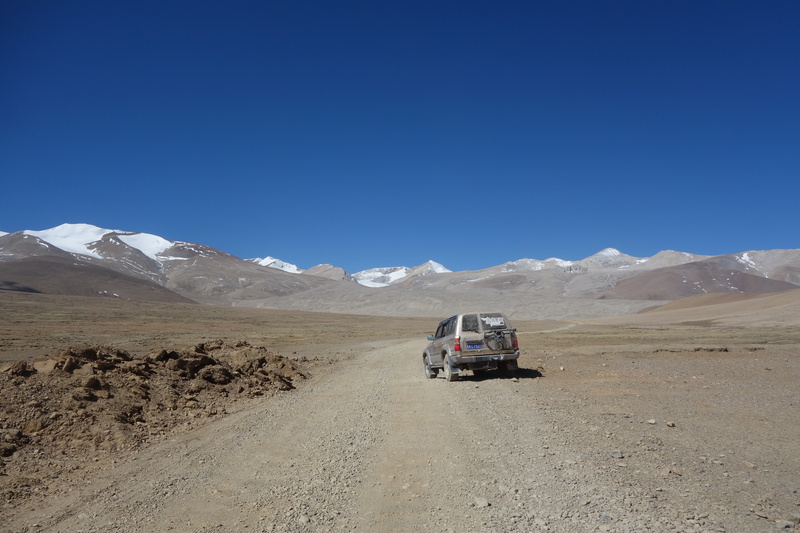 A four wheel drive is waiting downstairs to transport us to the Tibetan frontier. For the second time on our journey we are forced to take an organised tour. The other being the three days we travelled through Turkmenistan to the Uzbekistan border. 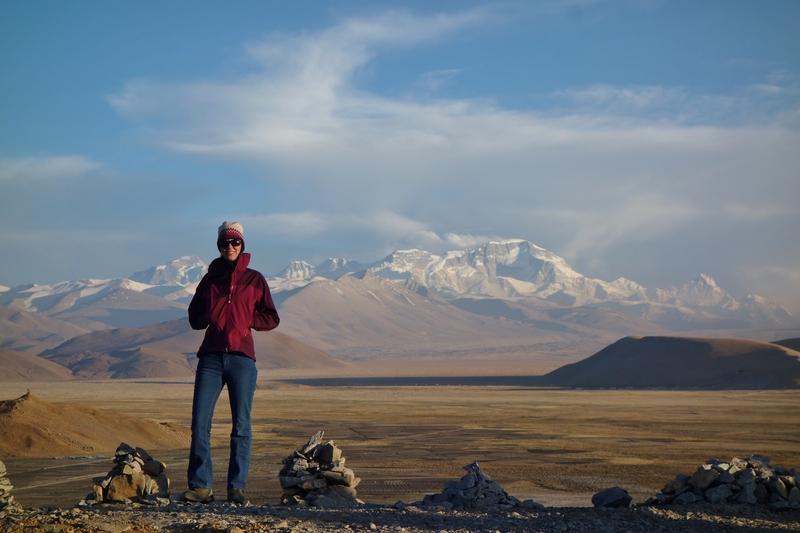 It’s not in accordance with how we wanted to travel but the rules of entering Tibet are simple…No independent travel permitted, an approved guide and private transport is required. Rick is coming with us as far as Lhasa but Matt is flying back to the UK. Our time with him in Nepal has been too short but his visit much appreciated and a wonderful and unexpected surprise. He had promised over a year ago when we started in Africa to see us somewhere on the journey and he managed to keep his word. Having spent almost three months here we are naturally sad to be leaving. 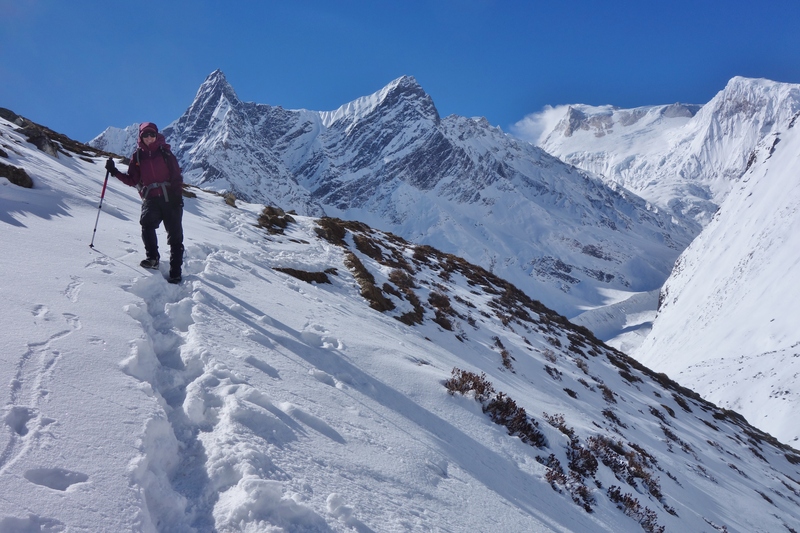 Nepal has been a combination of difficult but rewarding days trekking over passes. Colossal views with cold mornings and colder nights high in the mountains. Long lazy days in Pokhara having long lazy breakfasts at Olive café. Sitting by the lake under the shade of Frangipani and Mango trees, contemplating what to do next. Fire and Ice pizzas, K-too pepper steaks and real chocolate milkshakes. I think about all the people we have met on the trails. Jaylan the young boy from Adelaide who crossed a pass that many men turned back on. His older brother Liam and parents Sue and Phil. It’s impossible not to think of that trek without thinking of them. Nasir and Habib who returned to Pakistan many weeks ago now. 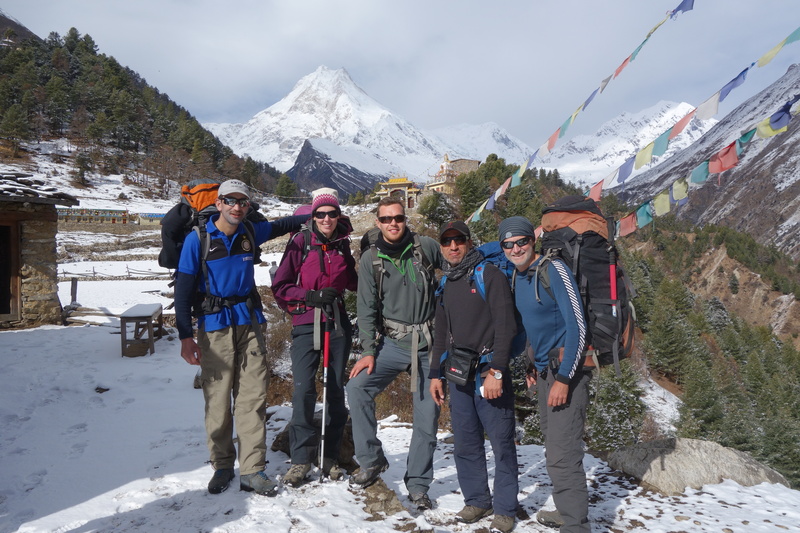 Then there was Jeremy from New Zealand and Chris from the US who were both at times so sick on the Everest trek but battled on regardless. Robbie and Marie from Scotland who were so happy and complimentary we made it over the pass, despite their own disappointments. August from Sweden who fell off a plastic chair in a tea house when one of the legs broke. They have all left, already thousands of miles away in distant countries and now it’s our turn, but our departure will be much slower and gradual than theirs. We wind our way through Kathmandu’s tight streets sadly one last time and head north through fertile green valley’s towards the Tibetan border. The sun climbs higher in the sky waking a chorus of insects. The heat builds and the haze intensifies. 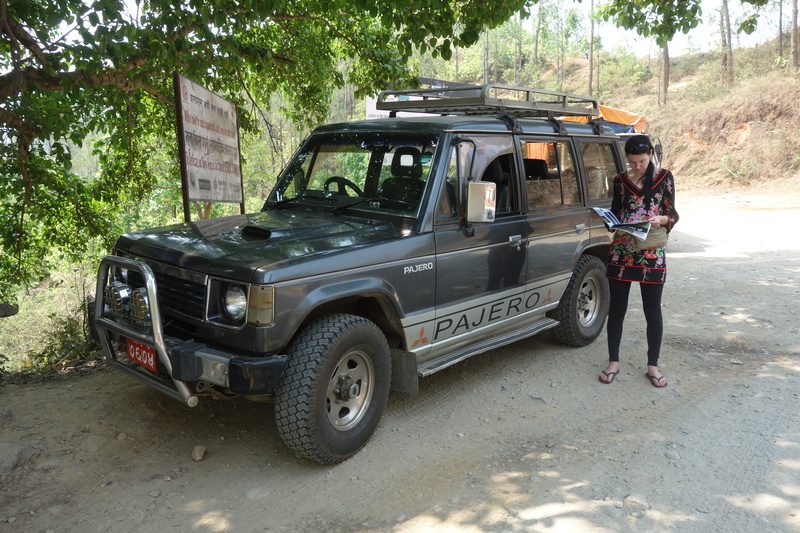 We pass through many checkpoints more than is expected for Nepal. 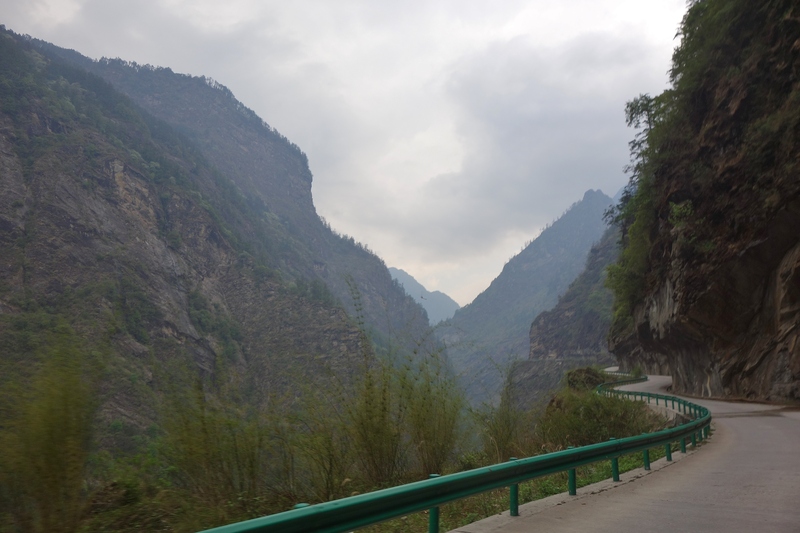 Our driver tells us this is due to the sensitivity of the Tibetan border or more officially the Chinese border. The road is in terrible condition and possibly one of the worst we have travelled along for many months. It’s as though Nepal doesn’t want you to leave and is trying to prevent your departure by physically blocking your way. The efforts are so intense that I manage to hurt my neck in the process. 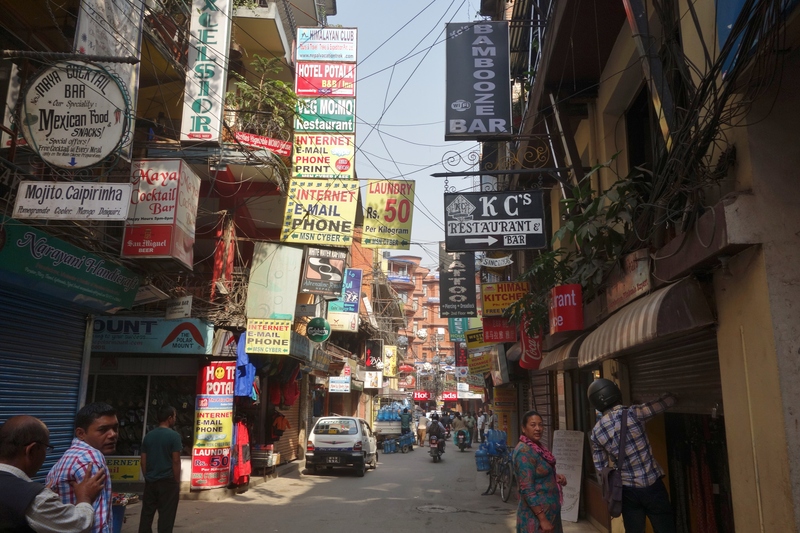 Four hours after leaving Kathmandu we arrive at a collection of multi-story run down hotels and the Nepalese immigration. It looks so sterile and not at all like the office we entered when we left India. The staff on the other hand are warm and helpful. They inspect our many documents mainly Tibetan and Chinese to ensure we won’t be sent back. Scrutinised and approved we are sent up a grubby road to a concrete bridge that spans a narrow gorge. Friendship bridge as it is known seems anything but. On the other side is Tibet or as it is now the People’s Republic of China. Half way across the bridge is a white line patrolled by two stern looking Chinese soldiers. Nepal it would seem is happy not to be represented. They inspect our passports motioning us one at a time to proceed to the immigration building at the far end of the bridge. It’s a cold and disciplined greeting, efficient, organised and brief. Inside our bags are scanned and searched. We are asked by one officer if we have any books. I decline then change my mind and respond… not sure. This seems to amuse the officer who checks regardless but somehow misses the small bag on my back. Much to Rick’s annoyance his recently purchased copy of the Snow leopard is found and confiscated because it makes references to Tibet. Waiting for us is a tall slim Tibetan man. His hair is blow waved and slightly receding. His jeans hang low on his slender hips. If not for a tight belt they would probably fall to the ground. 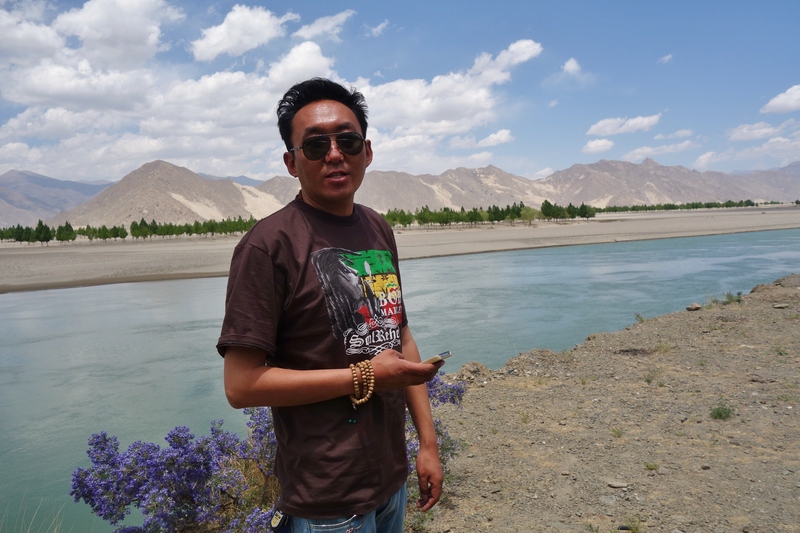 His name is Jamyong and he will be our official guide while in Tibet for the next 8 days. Our bags absent one less book are transferred to back of another four wheel drive. The buildings on the Chinese side of the valley are generic and unremarkable and for the first time in 10 months we are back to driving on the right hand side of the road. The road once out of town climbs steeply. The forest gives way to low spindly bushes and eventually open grass lands. The temperature drops dramatically. With every hairpin we lose a few degrees. In just 36 kilometres we gain over 2000 meters in height. It’s hard to believe that just a few short hours ago we were sweating in the heat of Kathmandu. The green valleys and crops are gone now, this is an utterly different world. The sterility of the Chinese border town is replaced with more aesthetically pleasing Tibetan villages. Flat roofed white washed buildings adorned with decorative painted wooden beams, door frames and windows. Colourful bunches of prayer flags complete the charming abodes. The villages may be Tibetan but the roads are very much Chinese. Smooth and unblemished, no one can discount their abilities to construct world class infrastructure in remote locations. 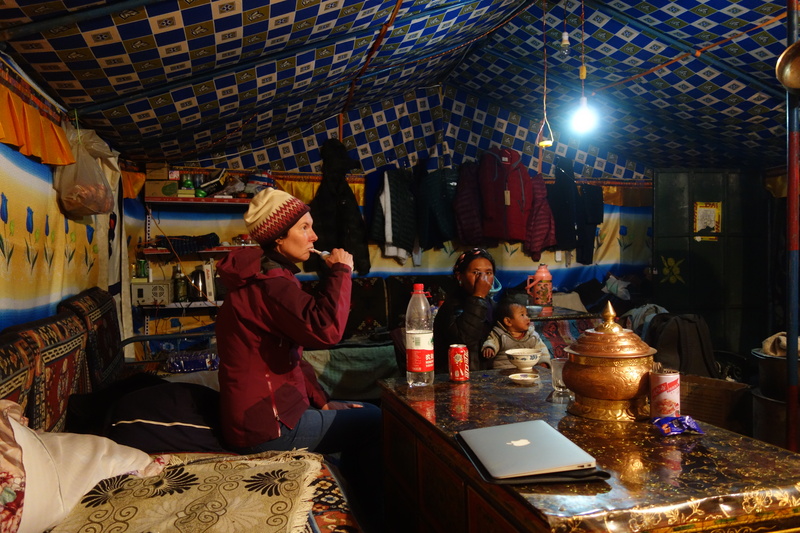 We stop for the night in Nyalam a village 3800m above sea level. 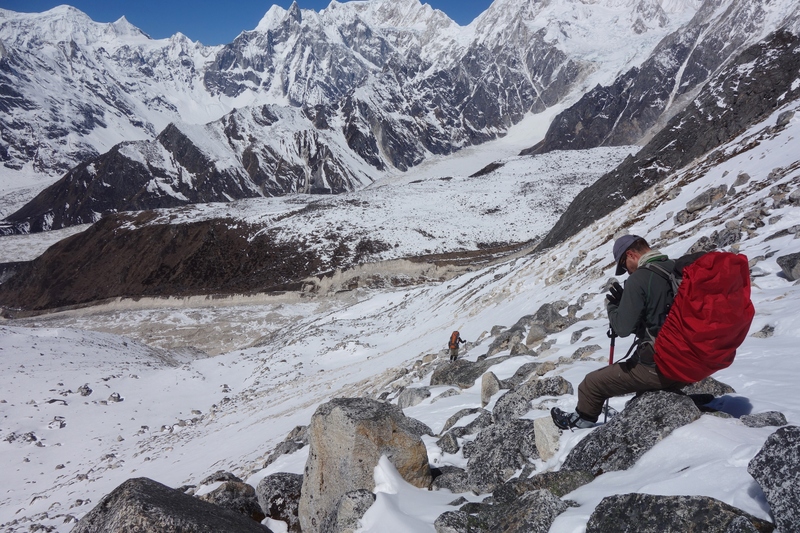 Our time trekking in Nepal should ensure we are acclimatised but our last 10 days were spent in Kathmandu at the relatively low altitude of 1100m. We are a little unsure if this may be a problem. Our itinerary outlines that we will spend the first night in a… very basic guesthouse. The fact they have seen fit to emphasise the word very is noted and we all laugh with nervous anticipation. The room comes as a surprise and is better than expected with comfortable beds and an ample supply of floral printed blankets. The common toilet would be best described as… very disgusting and thankfully is not attached to our room. The next morning we leave early. It’s again a relatively short drive owing to the steep climb in altitude. We reach Tingri at 4200m well before lunch. It’s another… very basic guesthouse this time with an… exceptionally disgusting toilet. We go looking for some snacks preferably chocolate or any form of crisps. I gaze at hundreds of strange products in each shop searching desperately for a brand I recognise, just a Snickers bar would do… but there are none to be found. That night we are woken to a chorus of canines howling and barking. They have spent most of the day asleep under cars getting ready for a busy night ahead. The barking goes on for hours but is so constant and regular that sleep is eventually possible. I discover the next morning after talking to the others that this is a view shared only by myself. I walk to the breakfast room praying for cornflakes on the menu but it’s just a cruel self-imposed torture. 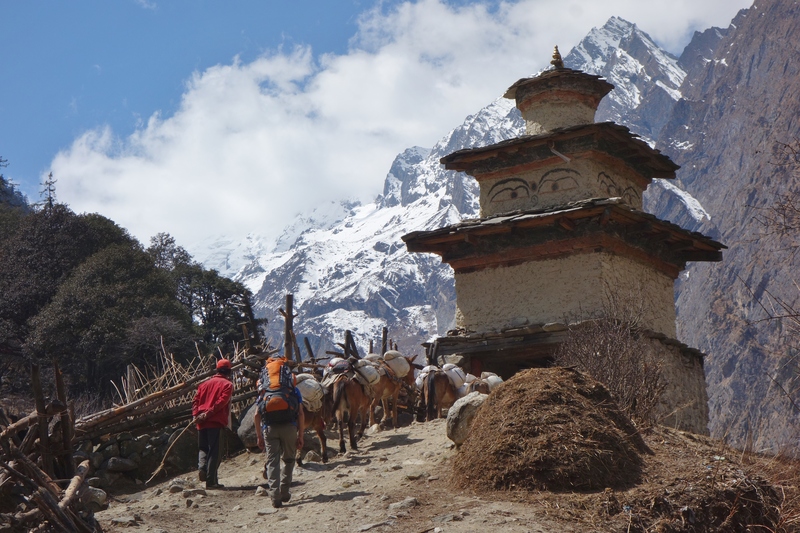 After a disappointing and lack lustre meal of noodles and a lifesaving but oily fried egg we head for Everest Base camp. We turn off the sealed road and head across a lunar surface. In the distance we can see Everest or Qomolangma as it’s known in Tibet, Mother goddess of the Earth. It seems a more fitting title as opposed to a British surveyor. 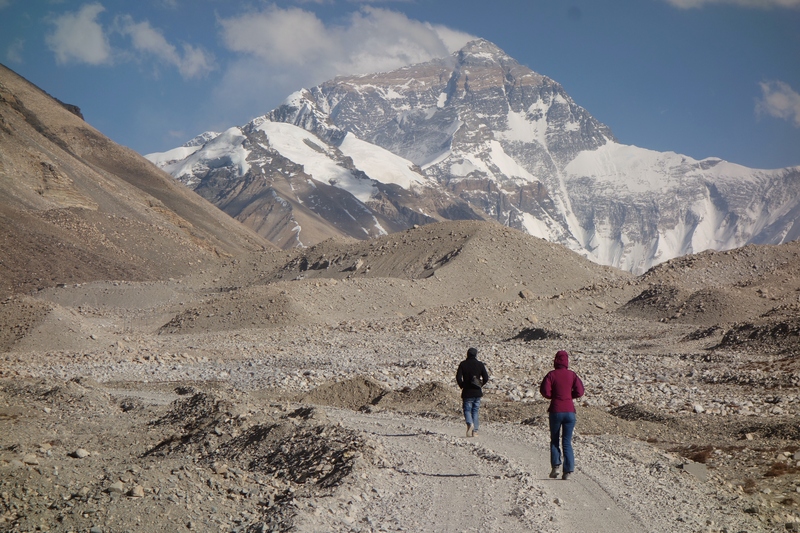 More dramatically and immediately in front of us is Cho Oyu, the 6th highest mountain in the world. It feels strange to be seeing it from the north when only two weeks ago we were looking at the south face in Nepal. I can’t describe why but I feel a longing to go back. I take in as much as I can almost fearful I shall never see it again. It’s a bleak road ahead that stretches to base camp. Bleached and baked by an unrelenting sun that floats in a deep blue sky. The sun is warm but the air is cold and dry. 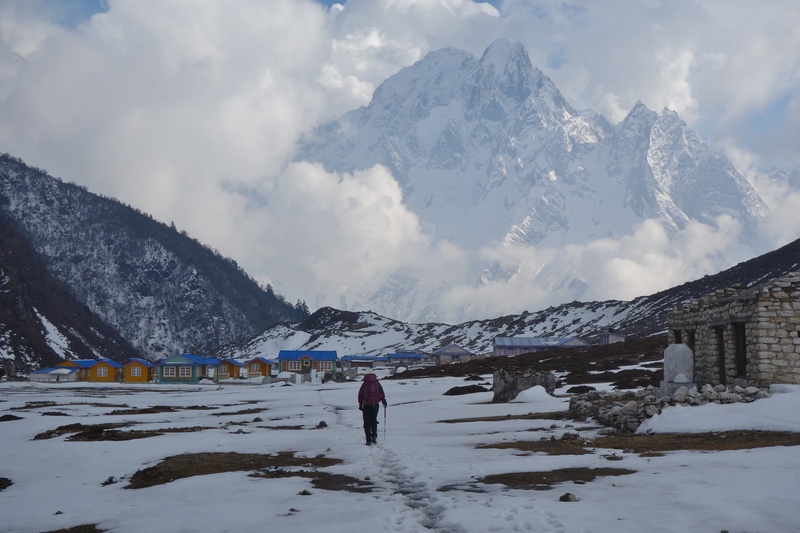 The cough that plagued me for several weeks in the Khumbu quickly returns. My ribs are still sore from the ordeal, it’s like being stabbed in the back with several sharp knives. I begin to day dream about warm moist air and a hammock stretched between two Palm trees. It’s amazing what altitude can do to the mind. We are now back over 5000m or 16,000 feet and despite being well acclimatised we all begin to suffer a little. Ambitions and aspirations are dealt a discarding blow by thin air. 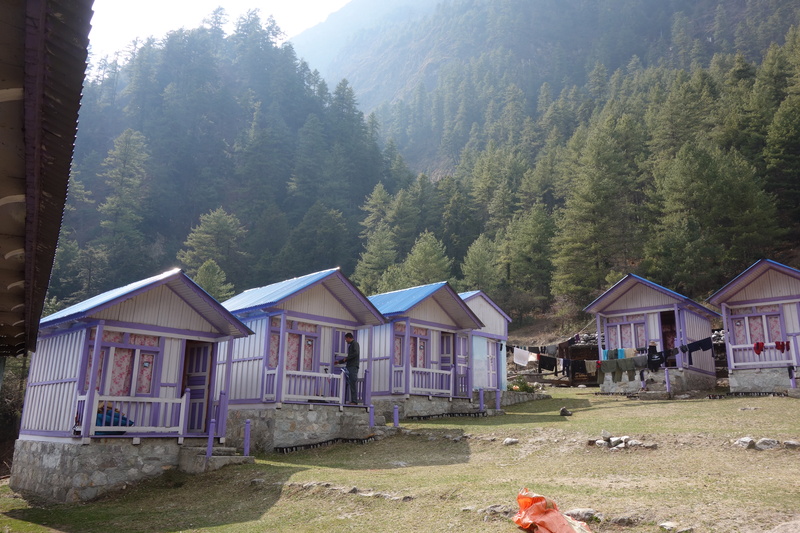 Three kilometres from the base camp is a collection of Tibetan nomadic tents that have been set up as accommodation for tourists. They are surprisingly comfortable, spacious and most importantly kept warm by a central stove. Our hostess has a kind face and extremely red cheeks. Her skin looks tough and wrinkled from the years spent at high altitude. Lying in a cot is small boy perhaps 10 months old. He seems curious to our presence and tries to pull himself up for a better look. He might be small in stature but already his heart and lungs are performing much better than the gasping guests in the village. We take a short rest before walking up to the official base camp. Owing to the road it’s a gradual climb and not too difficult. The strength of the wind however is cutting, large plumes of snow and cloud are being ripped from the summit of Everest. The North face is exposed and more of the mountain can be seen from the Tibetan side than from Nepal. It appears completely different in shape but still dwarfs all its neighbours. Waiting at the base of a small hill is a large armoured personnel carrier. Inside are three very impatient Chinese soldiers. The sun is going down and casts a pink light across the mountains. The soldiers seem unaware or perhaps uncaring of nature’s work and start blaring the horn to signal it’s time to leave. This would never happen in Nepal or India where uncaring takes on a different meaning. The next morning and we all awake with a decent headache. Nothing too bad but enough to desire a quick departure. 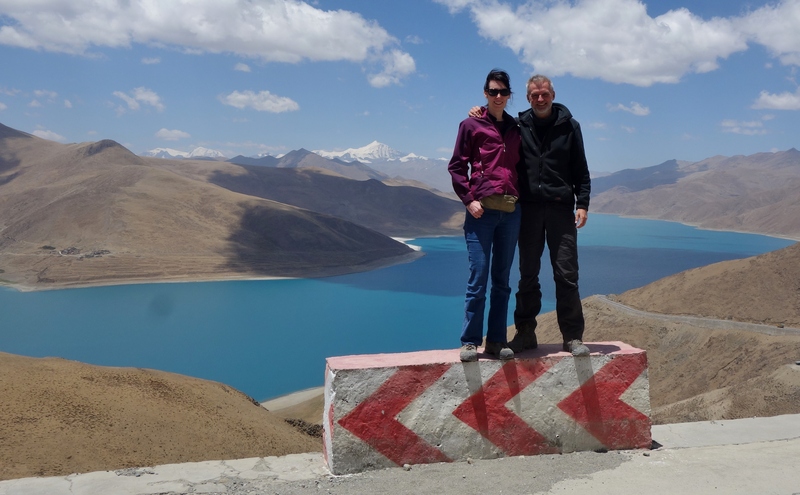 After backtracking to Tingri we reconnect with the friendship highway and head towards Shigatse, Tibet’s 2nd biggest city. Tibetan cities and towns seem to follow a pattern. The new and unimaginative Chinese part of the city that rapidly envelops the old and charming Tibetan quarter…Shigatse is no exception. But despite the Cultural Revolution and an ever increasing presence of Han Chinese Tibetan culture persists. The Tashilunpo monastery is the home of the Panchen Lama but Jamyong tells us he spends most of his time in Beijing now. I find Tibetan Buddhism highly confusing. Dali Lamas and Panchen Lamas, Future Buddas, Compassionate Buddas, Blue Buddas and Green Buddas. The eleven headed Budda and the thousand armed Budda. Reclining Buddas, standing Buddas and Buddas seated in the lotus position. The rituals of burning juniper, prostrating and pilgrimage all stem from Bon beliefs which was the indigenous religion of Tibet before Buddhism swept the lands in the third century. 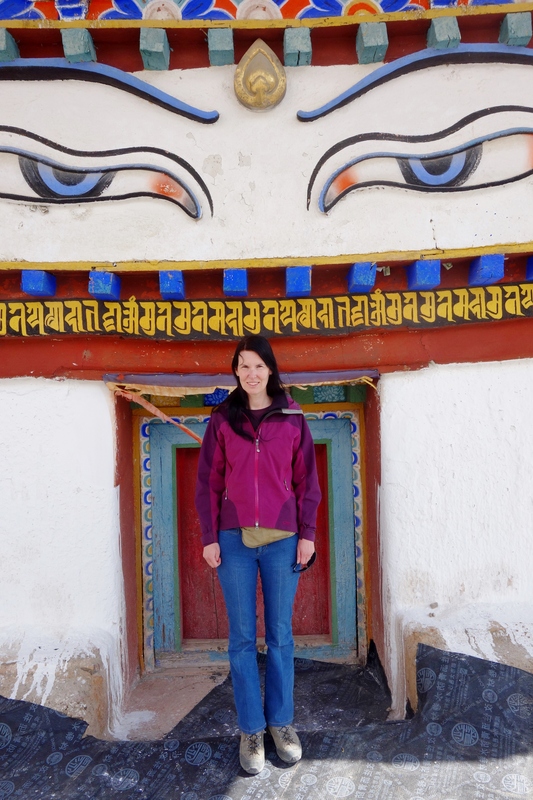 Six days after leaving Kathmandu we arrive at the ancient Tibetan capital of Lhasa. Atop a small plateau sits the unmistakable shape of the Potala Palace. But there is very little that is ancient nor even old about Lhasa these days. A once mysterious and forbidden city is now rushing into modernity at an alarming rate. 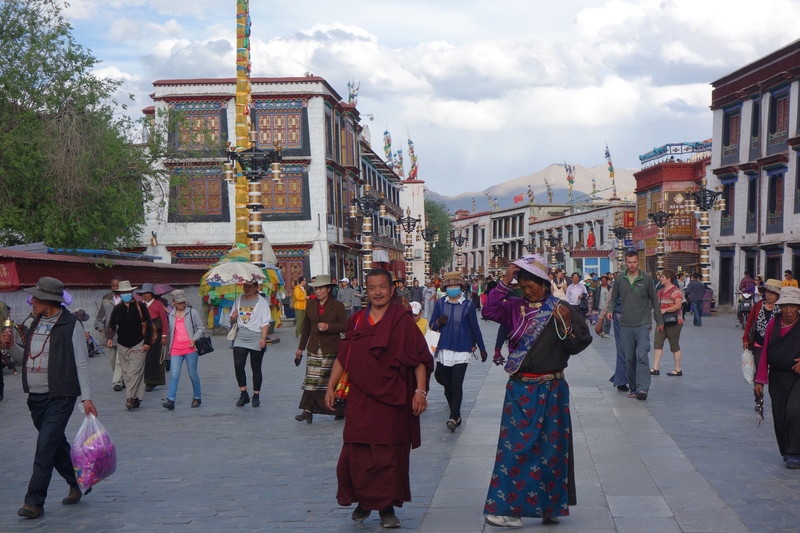 Thankfully just east of the Palace is the old Tibetan quarter that still retains much of the cities former charms. 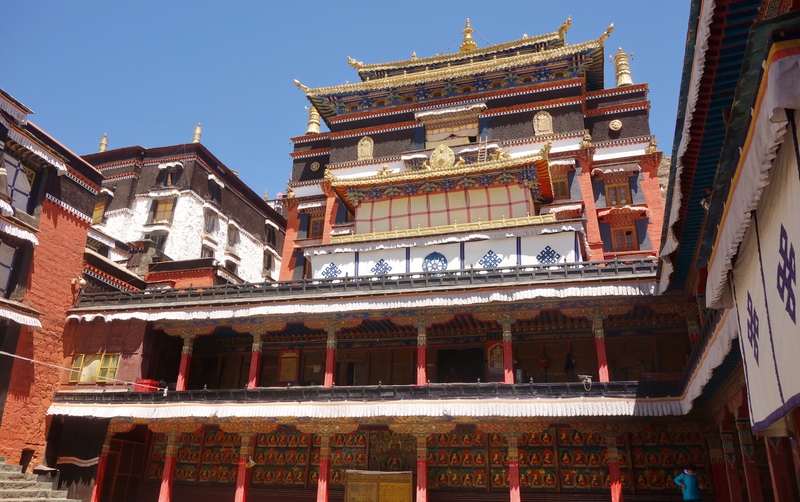 At the centre is the Jokhang Temple which dates back to medieval times. Contained inside is a statue of the Budda said to be over 2500 years old and blessed by the Budda himself. It sits in a dark alcove, face golden and eyes staring at the faithful who have worshiped here for centuries. They regard the statue with wonderment as if it were the Buddha himself. Jamyong tells us it is the 2nd most important statue in Tibetan religion. They seem to find rankings very important. At nearly four kilometres above sea level and with over 300 steep stairs to ascend, our visit to the Potala Place must be one of the most asphyxiating tours on earth. The palace once inhabited by monks and The Dalai Lama is now occupied by tourists and their guides. Most impressive is the tombs of the previous or prior incarnations of the Dalai Lama. 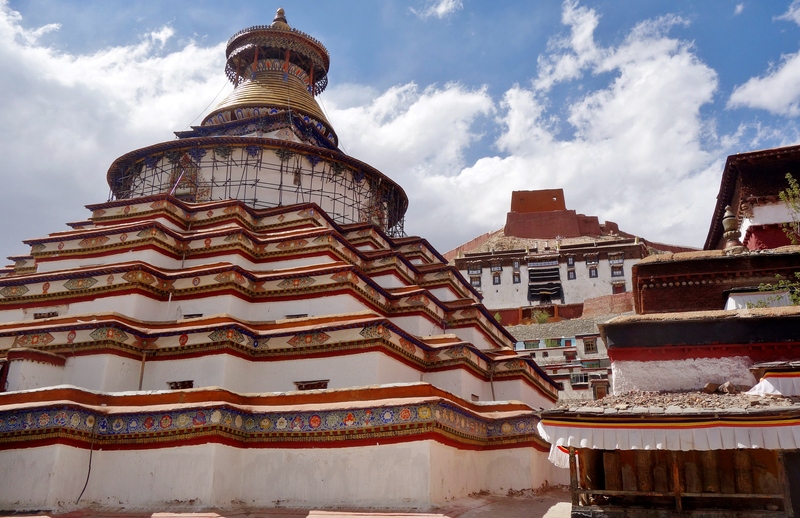 The fifth Dalai Lama’s tomb is gilded with more than 4000kg of gold. I can’t help but to think how a religion dedicated to meditation and enlightenment evolved into tombs cover with Fort Knox. But it seems to be a pattern with world religions. Despite being possibly a fiscal waste there is no denying the Magnificence of the finished product. 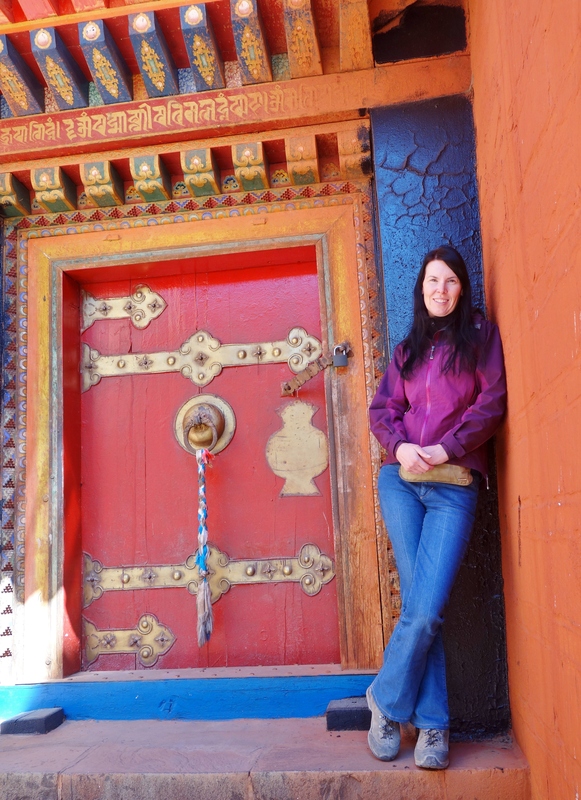 Ten Kilometres from the city centre is the Sera Monastery. I am not certain where it ranks among Tibet’s hierarchy but it does every afternoon host a bizarre event. The Buddha originally believed that teachings and philosophies should always be questioned and examined before one can accept them. With this in mind the monks gather and for several hours argue about the teachings of the Budda. Some men sit and propose ideas while the standing monks refute and argue the claims passionately with hand slaps and personal remarks. Occasionally small rocks are thrown and even the odd face slap made. But it’s mostly all in good fun. One particular battle rages close to us for over an hour. 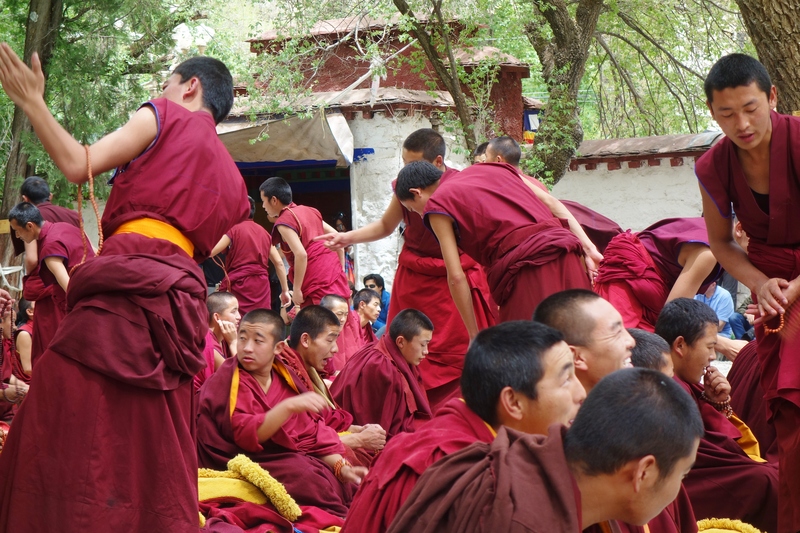 At first it seems difficult to gauge who is winning but eventually the standing monk goes into a flurry of mocking laughter and repeated slaps of the hand. His opponent looks dejected and defeated. He calls for reinforcement but it’s too late and the standing monk see this rightfully as a sign of weakness. We never do learn what tenants of Buddhism are discussed. The sky is still speckled with stars, it’s 3.30am and I’m struggling to eat a poor excuse for porridge. Today we cross the pass and whilst I’m looking forward to the prospect of going over, I can’t help to be a little apprehensive as we shall be the first group to attempt the crossing this spring. The Larkya la is notorious for being difficult to cross, especially in March owing to heavy winter snows that persist on its slopes. None of us had expected the constant daily flow of groups returning down the trail defeated owing to bad weather and impassable conditions. Their faces etched with a mixture of disappointment and resigned acceptance. A group of four polish men had first alerted us to the situation on our second day of trekking. They all appeared very strong and capable, so their turning back was alarming for all of us. We calculated that we would reach the point where they retreated 9 days later and so hoped that conditions would improve, but every day we were met by more groups returning right up until yesterday when a small group of four had turned back at Samdo, which is half a day’s walk from Dharamsala. 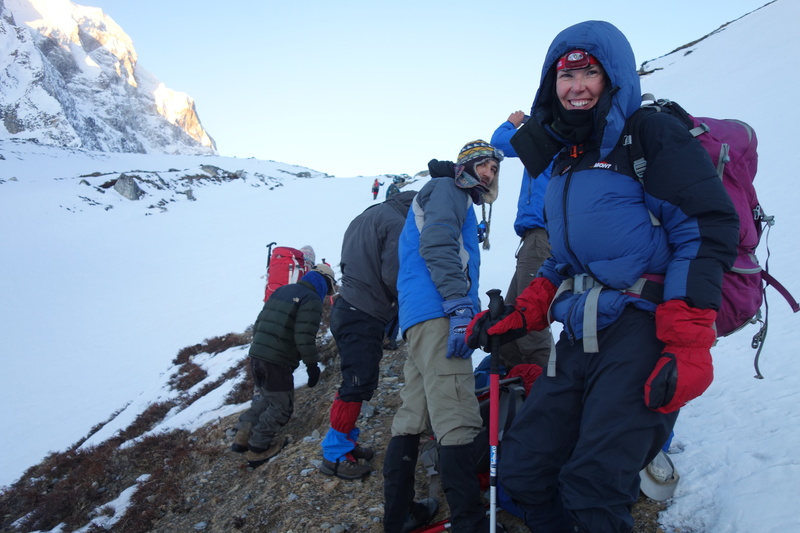 They had in fact been the first to reach this point but decided not to continue up to the high camp. In the last few days we have teamed up with a family from Australia. Phil and Sue, Liam the oldest son is 18 and Jaylan who is remarkably only 9 years old. We decide as a group that the snow conditions look difficult but achievable if we commit to a very early start. 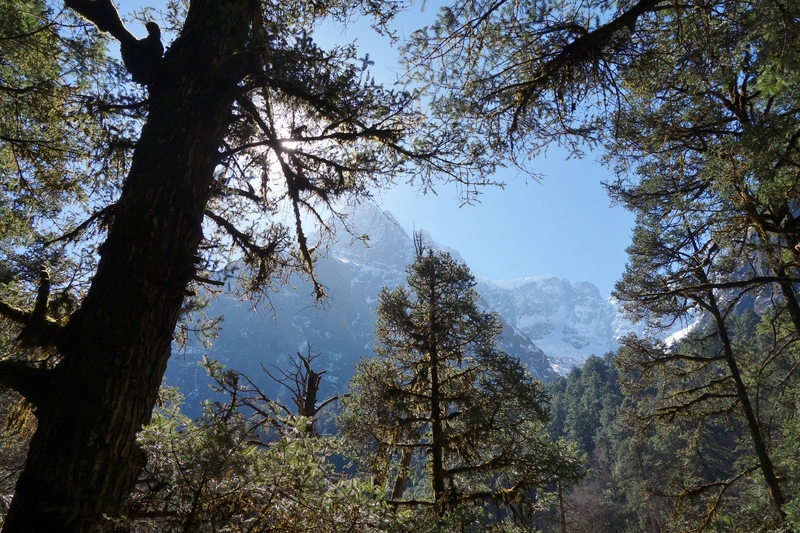 The walk up to Dharamsala proves manageable and we were able to stay for much of the time on top of the frozen snow and reached camp just as it began to melt. The final hour was diabolical but we reached high camp in just under four hours. With our good friends and fantastic mountain guides Nasir and Habib from Pakistan here with us, I feel a sense of comfort at least. I finish the last mouthful of porridge and deliberate if I’ve eaten enough to sustain the crossing. In my pockets are granola bars and I go through my bag to ensure all my essentials are there. Today we estimate the trekking time will be around 8 hours maybe an hour or so more given the snow conditions. I pull my balaclava over my head and secure my head torch and walk out into the cold night. The snow crunching beneath my feet I try to keep a steady pace whilst regulating my breathing affected by the thin air. The moon bright tonight, revealing the mountains in the most beautiful cool light, it’s hard not to be distracted, but I try and keep eyes fixed on the back of Habib who’s a few feet in front. Walking in a straight line and closely together, we come to a sloped area that feels a little icy and I quickly lose my footing, cursing I wish I’d packed some small crampons. I make a mental note as I pick myself up to always ensure that I have them in the future, it’s crazy that none of us have a pair. Fortunately the climb up the pass is not too steep but traversing across the smooth hard packed snow is difficult and we all take turns in slipping and sliding down the gulley a few feet. We are lucky so far not to have encountered too much ice and it is only due to this blessing that any attempt is possible. It’s impossible to know what the ground is like and we remind each other to be careful, it would be easy to make a mistake and twist and ankle with such unstable footing. I look up ahead and see Rick, he’s falling into all sorts of deep snow and sits down to take a break. I myself am making progress but am continuously dropping again and again into knee deep snow. The pass going up may not be steep but it’s never ending false ridges tease and break your heart. After a couple of hours the sun rises behind us. Sunglasses go on and down jackets come off. Within minutes the temperature soars. The snow which is already struggling to support our weight gives in and becomes a powdery mess. Our progress is now reduced to crawling out of holes, every third step and sometimes less. At times it’s so bad that your hands also sink and you have to wriggle out using your torso. In desperation we take to jumping across from one rock to another. Occasionally we miss the target and sink down again into the white prison. All you can do is curse and laugh at how ridiculous the situation is. As I reach another ridge, I can hear above me everyone’s happy chatter, and it can only mean one thing… this is the top. It’s taken just over five hours to reach. The guide book assumes it normally takes around three to four at most. Congratulating each other on what has been a taxing morning our attention turns to the descent on the western side of the pass and it looks incredibly steep. What’s more unnerving is how hot it is already and how badly the snow has started to melt, something we’d been fearful of. Nasir and Habib tell us they have never encountered this kind of snow before. “It’s so powdery” Habib say’s. Normally in Pakistan the snow is much more firm and stable. He tells us how on the way up he had nearly fallen into a lake, he had been very lucky. I can’t even remember where there might have been a lake, maybe a good thing for me that I wasn’t aware of this precarious situation. We slowly begin to make our way down. I look to my right and see a steep slope where any loss of traction would soon see you sliding onto the glacier far below. Further down Greg and Nasir are in a hazardous situation. I watch horrified as Greg drops into waste deep snow and Nasir self-arrests as he slides rapidly down the slope. A large slab of snow has broken free and tumbles down the slope. There is a moment between them as they look at each other worried. 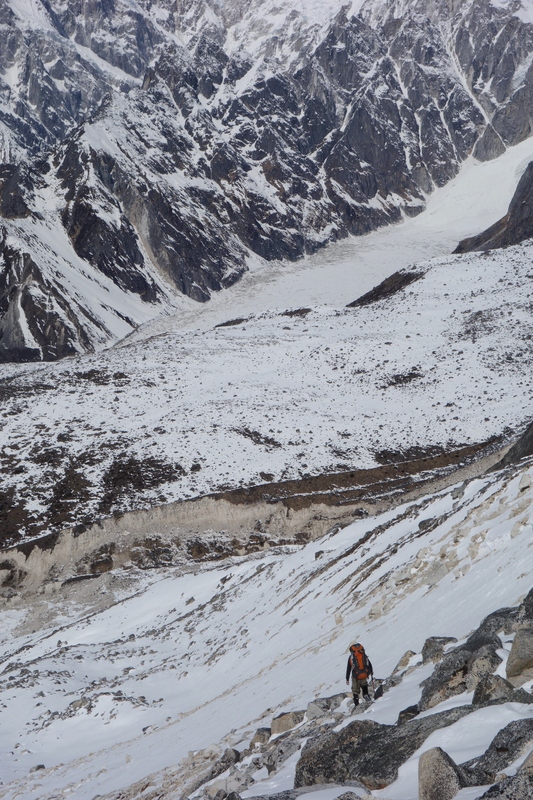 Nasir shouts up to us that the snow is really unstable and we need to be really focused. I start to wonder what we’re going to do if there is an accident but dismiss these thoughts as I realise that I have to remain calm and concentrate on the task at hand. Everyone looks a little frightened. My throat is dry from heavy, nervous breathing. I realise that we are committed to getting down. There is no way we can climb back up now. We must keep going and we must do it safely. The slope is so unstable that I lean into my metal pole to support myself and as I pull it back out to move it has been bent into a shape that resembles a Urie Gellar illusion. Sections leave me breathless and my forehead hurts from the muscles tensing up from clenching my jaw and frowning. This is the most physically challenging task I have undertaken. Rick shakes his head. Shouting up to me he asks for my thoughts on how we’re going right now. I shout to him “one word springs to mind…ordeal” he shakes his head again and agrees he to thinks this is the most difficult thing he’s ever done. Thank God it’s not just me. I look at everybody else and see the strain on their faces. I know we will get through this but right now I am seriously wondering what I am doing. I must be nuts…..
Every third step I fall into thigh deep snow and as I come to an icy section, terror pulses through my body. My pack feels so heavy and is weighing me down so much and pulling me off balance. I see the boys below sitting down and sliding down a shallow gully spreading their body weight across the snow. I take their cue and do the same. I am sure I saw Bear Grylls do this once on his TV show and it seems to be doing the trick. I cover ground much quicker though stopping is somewhat tricky. I have to dig my heels in hard to arrest the slide. Greg shouts up to me that we’re nearly there just a few more sections to go and we’ll be on dirt again. I am so relieved to have finally reached bare earth. I sit for a moment to slow my breathing. I am so thirsty my lips are cracking from dehydration. 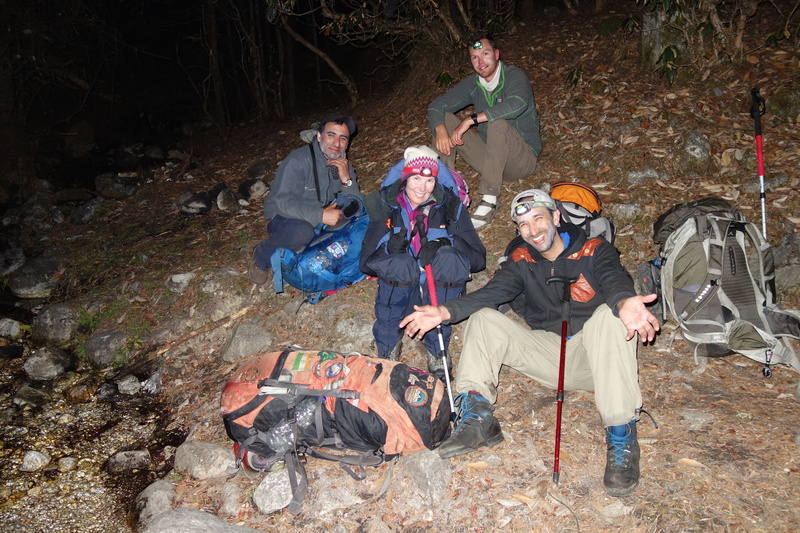 I throw myself down and lie on my pack, gulping water it’s been over 8 hours of continuous slog and I am very thirsty. We all change out of cold weather gear and cool down. 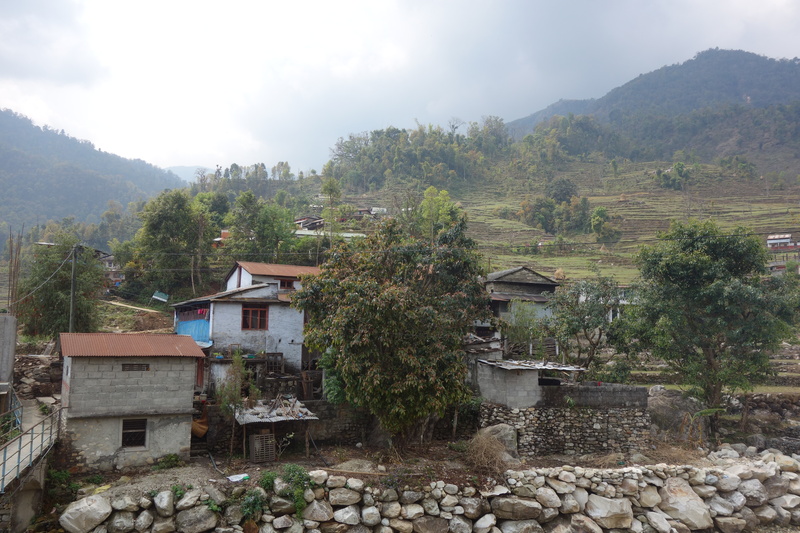 We have another 3 to 4 hours of walking until we get to the town of Bhimtang. Everyone is ecstatic to have crossed the pass. We have done it and celebrate and start talking about the food and the drinks that we will have when we get to Bhimtang. I have around half a bottle of water left, if I sip conservatively it should be enough. Legs shaky and bodies aching we make for the last section it seems to go on forever. As I take my last sip of water Greg points to an area where small buildings are dwarfed by a giant mountain. I decide on sight that I will finish my water, we’re only an hour a way I think to myself. When we get there I will have a nice cold can of coke. As I drag my feet through the last section of town. I see the boys all sat outside a tea house. As much as I find the idea of a welcoming committee a nice gesture I find it odd. But as I draw closer I see no joy, no laughter, nothing and then I realise why. I can’t utter the words to myself it can’t be true…. Nothing is open, the town is shut! We can only deduce that because no one has crossed the pass this year and with so many people having turned back, the tea house owners have remained shut waiting for the snows to abate before opening. I am in shock. I can’t believe this is happening and I sit down deflated and despondent. We seriously contemplate breaking in and paying for any damages caused later, we are that desperate and tired. It becomes a serious option that is discussed but our guide Dilly is not confidant this is a good idea. The next town is still another 4 hours away but already the sun is starting to disappear behind the mountains. In the next hour or so it will be dark and cold. We have run out of food and have no water left. I am reluctant to continue. I’m worried that we will arrive at the next tea house and that too will be closed. But what are we to do, we are forced to continue. We’re all so cold and tired but we put our backpacks and head torches on anticipating the fading light to come. We talk of the possibility of wild camping something I am becoming increasingly in favour of. We walk past a few small caves, stop and look but resign to carry on. We stop near a river gasping for a drink and take the gamble to fill our bottles with the stream water. My overwhelming thirst diminishes any kind of concern. I just hope that the water is clean enough not to make me sick. The sterilisation tablet should work under normal circumstances. Not a morsel of food has not passed any of our lips for nearly 5 hours. My stomach is so noisy that its rumble can be heard over the sound of our footsteps. Night envelopes and we take a break to discuss what we should do next, should we continue or just lie down under a tree. We look at the area we’re in, it seems ok. But as we look at a moon being draped in clouds we debate what we would do if it were to rain during the night. Our down sleeping bags would be soaked. No we must push on and keep going. I know that this makes sense but physically my body is fighting every decision I make, it simply wants me to lie down. We press on. Hours pass and we try to keep each other’s spirits up. I can’t help to feel sorry for Habib and Nasir this is supposed to be a holiday, a time to hang out with us, enjoy a relaxing trek. Nasir tells me that he and Habib have never had such a challenging situation. They too are now exhausted. Our conversation halts as we see a torch light coming towards us. Dilly has seen ahead a building. A jubilant cheer erupts. But there is a hitch…of course. The building is just a shell there is no one there no windows, no doors, no food and no beds but there is a roof to provide shelter. None of us care we will sleep here tonight and tomorrow continue to the next town. I don’t even care that I won’t be able to eat. I am passed that need. All I want more than anything right now is to get in to my sleeping bag and sleep. I don’t even care that I am sleeping on planks of wood. My eyes are heavy I look out at the stars and a moon washed with fleeting clouds and drift into a deep sleep. The sound of talking awakens me. My body is stiff from sleeping on hard wood. I have a tingling sensation running up and down my back. Outside a fire has been lit and the boys are sat around warming themselves. I pack up my things and climb down the ladder from the second floor. It’s amazing how hunger can motivate a person. We are hopefully just a couple of hours away from the next tea house. Of course we have to hope that it is open given what happened yesterday in Bhimtang. But we must continue regardless we have no choice. I sip what remains of the river water in my bottle, so far this has not caused any of us to be ill. We set off through some of the most pristine pine forest I have ever encountered. The floor of the forest is soft with fallen pine needles that have built up over the centuries. It’s so beautiful that I am momentarily distracted by a rumbling tummy that has had no food in over 18 hours. We walk past ancient trees covered in moss, every now and again breaking into open areas where gigantic mountains soar high above. Two hours later we sight a small collection of houses on the far side of river. We cross a small bridge but can see no sign of activity. The first few houses are empty so we continue up a small slope and around a bend. There sitting in a charming garden is Habib, Nasir and Dilly. I can see a lady wiping down tables inside the dining room. We have made it. Thirty hours after leaving Dharamsala we can at last relax. I feel relieved to have reached a soft bed and warm food. We arrive at Varanasi station cloaked in darkness. Despite not the slightest hint of light to the east the station is already heaving with people. 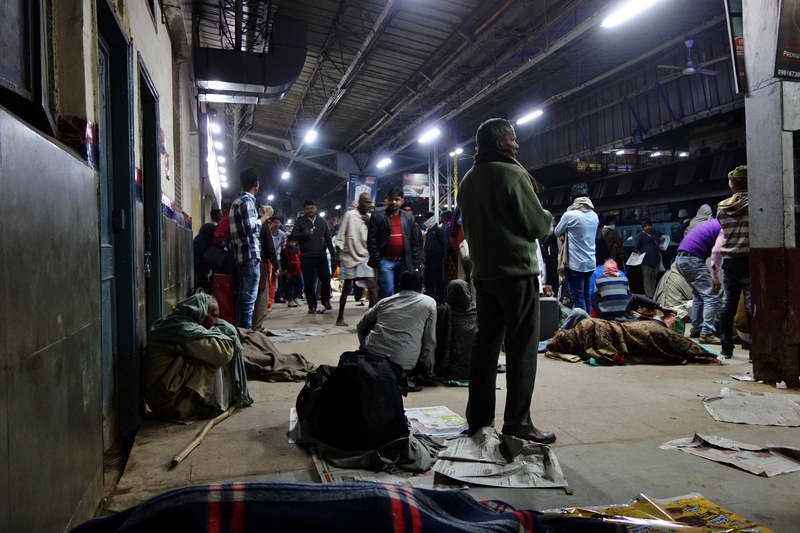 Many of them lie discarded on the platforms having spent a chilly night under thin blankets. Others less fortunate huddle together with shirts wrapped around their heads to keep warm. As yet there is no expected time of arrival for our train to Gorakhpur. The swelling crowd seem ambivalent and more interested in obtaining chai. I go in search of the station master’s office. During our travels through India I have always found them extremely helpful and eager to guide a hapless foreign traveller. This morning is no exception. A loud man with a thick moustache and a straining belt directs us to the train’s conductor. He informs us that the train is delayed but is expected to arrive within the hour. There is nothing to do but find space on the crowded platform and join the others in search of chai. Two hours later the train finally arrives. The conductor waves to us and nods. I think they feel sorry for us, almost knowing we are not used to pushing through crowds and fighting our way onto trains. We have been spared significant dramas in the last few weeks, but as if knowing this is our last train ride in India we are dished up one last epic battle. As the train slows the normally passive Indians panic and surge toward the open doors like frightened livestock. Standing back and waiting is tempting but also risky as you may not get on before the train departs. We pick up our bags and enter the fray one last time. It’s a strange experience for us westerners. We would normally associate pushing and pulling as acts of aggression but here it’s just required survival and nothing personal. The idea is to smile remain calm and fight harder than the person next to you. For us it’s not always easy but with practice you start to get the hang of it. I glance at my opposition most of whom are several inches shorter and many kilos lighter than I. A few well timed pushes and arm blocks and we are on the train. Having built up the required skills it feels almost a shame to be leaving now. We head north through farm fields and flocks of yellow flowers. I take one last opportunity to stand in the open door. It will be several months before we are on a train again and possibly none will allow you to open doors and sit on the stairs. 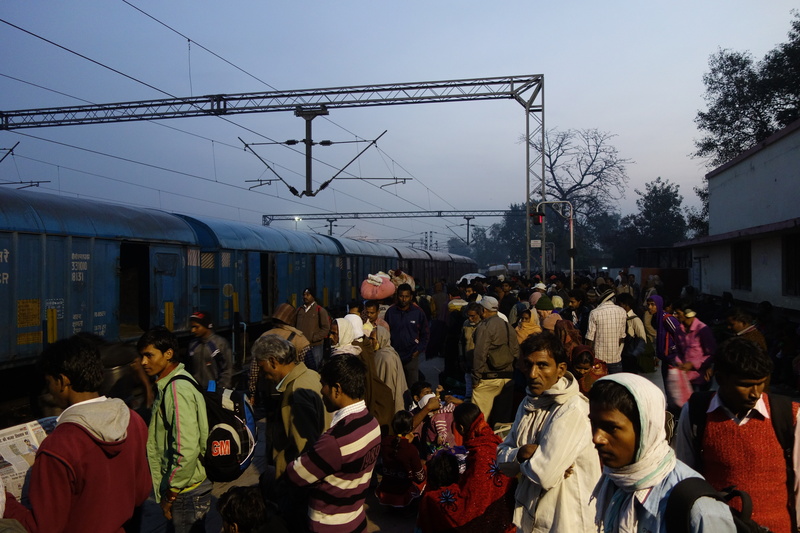 We arrive into Gorakhpur station 6 hours later. By now it’s well after lunch and we still have a 3-4 hour bus ride to Sonauli at the Nepalese border. Motorised and manpowered rickshaws descend upon us as we exit the station. Apparently its several kilometres to the bus stand and too far to walk. A helpful policeman directs us to a corner about 100 meters directly in front of the stations main clock tower. A statue of a once important man astride a horse sits in the centre of the intersection. There waiting among goats and cows are several busses. 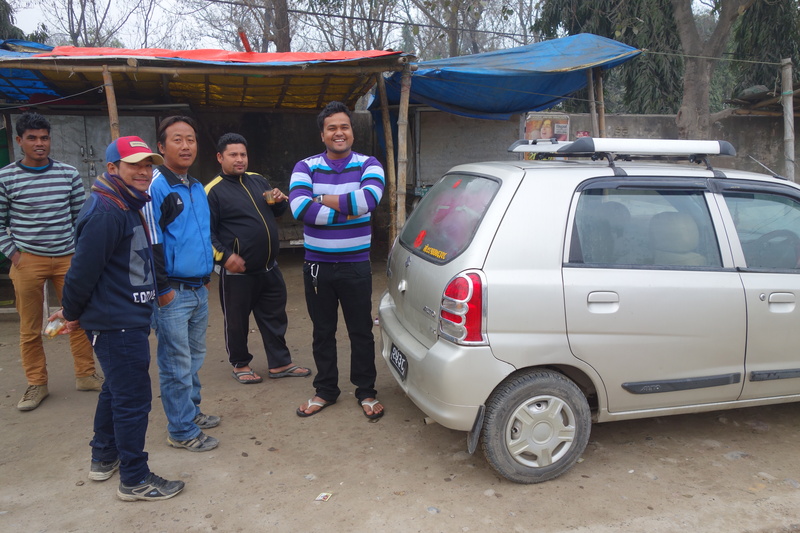 One driver immediately spots us knowing almost every westerner in Gorakhpur is heading to the Nepalese border. 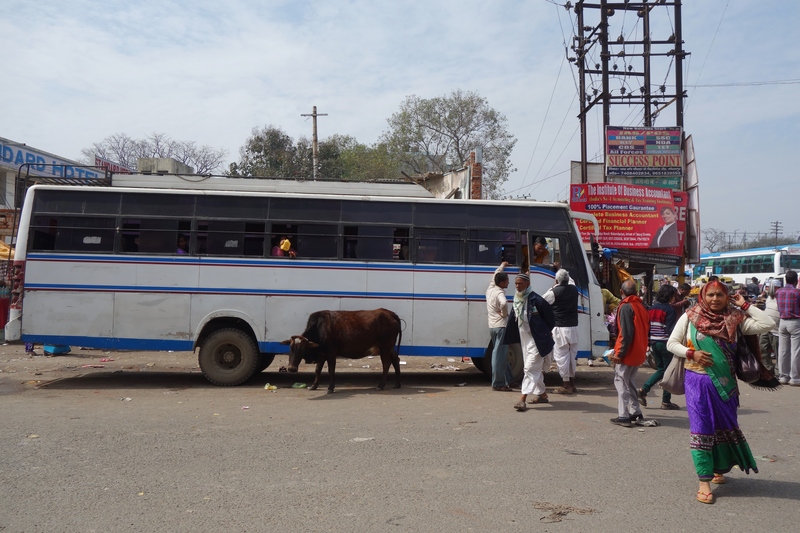 He shouts out Sonauli, Sonauli and ushers us onto the bus with false promises of a quick departure. The bus is about half full so his claims appear at first possible. An hour passes with only a trickle of passengers joining. To pass the time I go in search of oranges and decide I shall leave India having secured the best price for them on the sub-continent. I just want to try and get the better of a vendor once before I leave. I succeed in passing time but remain marginally ripped off. The bus remains idle, its engine cold and unwilling to start. It’s now almost 90 minutes and even the locals are growing impatient and angry. One passenger is shouting at the driver and then appeals to me in English that this is scandalous and criminal. He is well dressed and I notice he is carrying a leather briefcase. I am guessing he is a businessman of sorts. He continues to berate the driver and conductor in loud bursts while speaking to me in a calm but condemning voice. He even apologises for what he claims is a national disgrace. I like the Indians and I love the way they use our language to great and sometimes colourful exaggerations. When the driver starts the engine and blows the horn we receive an immediate surge of interest from people on the street. The empty seats fill up quickly. Why he did not do this almost two hours ago is completely beyond me. With practiced tolerance and a pretence of cultural understanding I assume there is a good reason but the businessman’s shaking head has me returning to the belief that it’s just simple stupidity. With great difficulty he performs a U turn and heads back up the broken road a 100 meters before stopping. He then makes in the narrow street a 7 point turn that takes almost 5 minutes to complete before coming to stop and killing the engine. It’s all too much for the businessman and he immediately erupts into a volley of abuse and fist shaking. I like having him here. There is no need to get angry, I have a proxy who is doing a splendid job. Several other passengers join in and the surge of condemnation is finally too much for the driver to bare. He starts the engine up, spits out the window and pumps his musical horn before setting off. 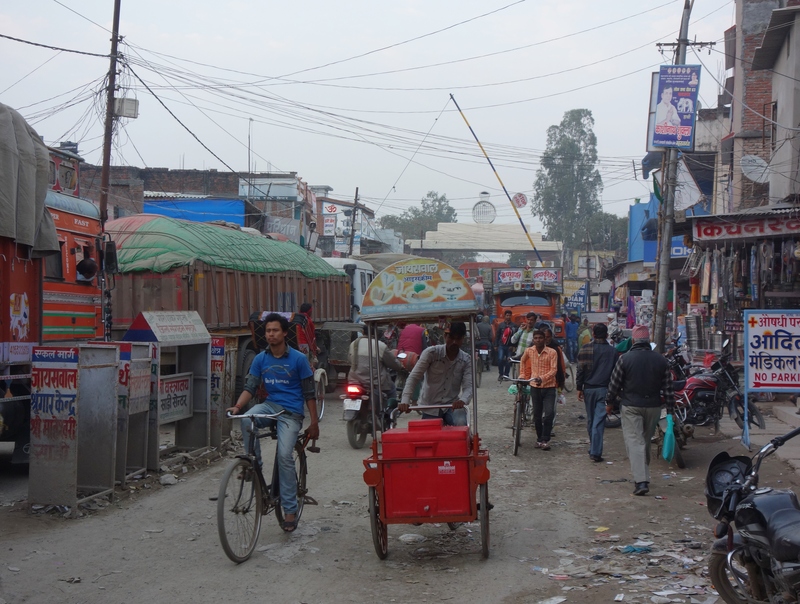 Four hours later our bus sighs, hisses and stops among the littered streets of Sonauli. We wait to make sure we have reached the last stop. The driver waves his hand and shouts Nepal border. We retrieve our bags from the back storage area of the bus, a blessed rarity in India. A few bicycle rickshaw men offer to take us to the border. As usual we are told it’s too far to walk, in reality it’s only a couple of hundred meters away. I feel a nostalgic urge to dwell and accept their services as I know we are now spending our final moments in this wonderful country. The flow of human and motorised traffic is unabated at the border. Indians and Nepalese are free to cross without passport and formality. As such the immigration office is rather non-descript and unassuming. The immigration officer almost looks relieved and keen to be of use. He stamps us out and bids us goodbye. We pause in no-man’s land to take a photo. Ahead is a white arch with a Buddhist chorten and a sign that says “Welcome to Nepal” A small group of foreigners are gathered inside the Nepal Immigration building. We fill in a form and hand over $100.00 USD each for a 90 day visa. Within ten minutes our passports are returned and we are free to enter what was once a forbidden Kingdom. 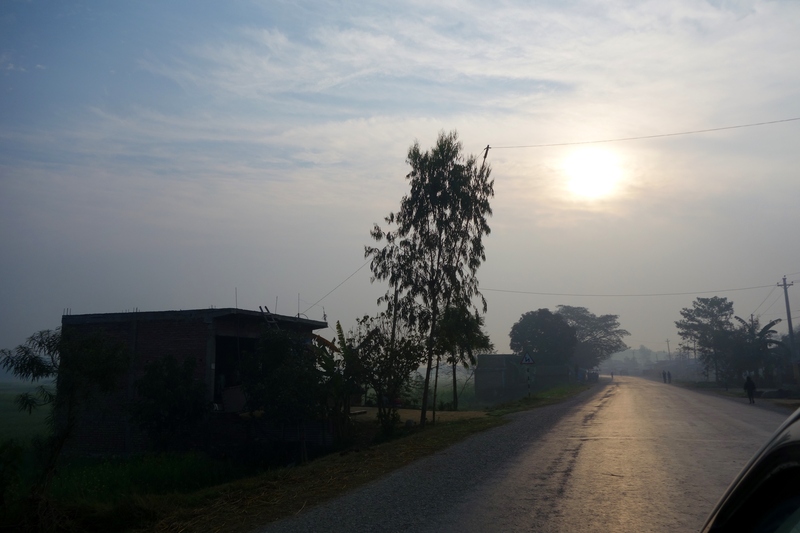 The streets on the Nepalese side of the border seem less littered although it’s a bit hard to tell in the fading light. The sun has set as we go in search of a hotel. It’s always best to leave a border as quickly as possible but Kathmandu is still another 10 hours away. The first few inspections are a little depressing but we eventually find a satisfactory room for 1500 NPR. Conveniently the Nepalese Rupee is currently trading at 99 to the USD dollar so adjustment to the new currency is made easy. Downstairs the restaurant is overstaffed and empty as our stomachs. We order a vegetable fried rice and an aloo or potato curry with two cans of coke for just under 500 NPR. I survey my surroundings with a combination of satisfaction and relief. It’s always comforting to have crossed a border. A feeling of progress and achievement on our journey. This time tomorrow night we will be in Kathmandu. 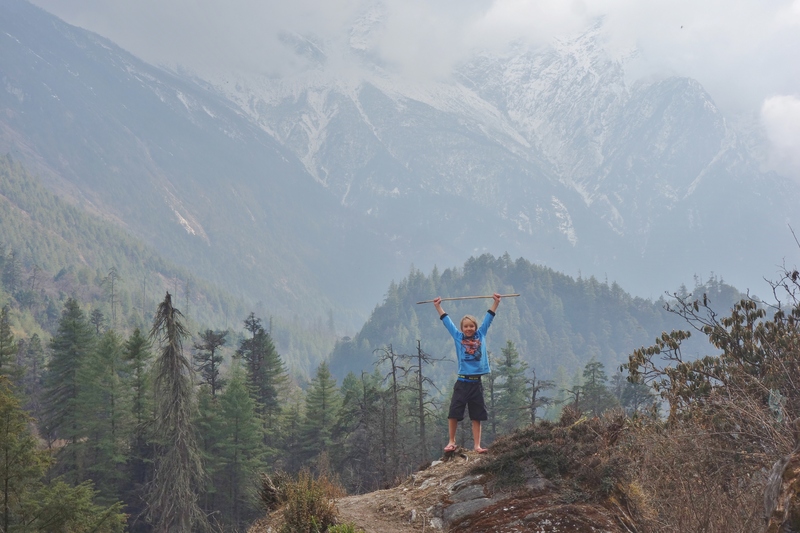 Our travels towards Singapore will for a few months cease as we spend time trekking in the Himalayas. The next morning Sonauli is blanketed in thick fog. I open the curtains. Below me a lady is burning juniper branches and a chant is being played on a loud speaker. Despite the excitement and prospect of reaching Kathmandu I feel tired and lethargic. Yesterday’s early start and the long delays in reaching the border have caught up with me. I test the shower optimistically for hot water or tatto pani but none is forthcoming. Outside I can hear bus engines starting up and a chorus of horns. By the time we pack up and walk down to the street they have all but left. One pitiful example remains rusting and empty. The taxi drivers circle around me like some weak member of the herd that has become separated from the others. I feel willing to succumb to them as I just don’t have the energy to wait for another bus and face a 10 hour journey. An immediate departure and a promise of 6-7 hours is too much and we cough up 8800 NPR. The starting price was 9000 and I pitifully manage to negotiate a $2.00 discount! The car at least looks clean and I run through several justifications for taking the taxi instead of the bus which would have been 600-800 NPR each depending on service offered. It’s a rare moment of laziness but I still feel a bit guilty. Our driver has a head shaped like a jelly bean and I find it difficult not to stare at him. He is friendly enough but not overly talkative. I am still a little annoyed at paying $88.00 USD to get to Kathmandu so I engage him in Nepal’s current economic costs. He explains that the cost of cars is very expensive when compared to India. I have no way of knowing this is true but nod agreeably. Our progress is slowed by the fog. Above the sun is trying to break through. The road is slick and shines like a mirror. So far there is no sign of the mountains for which Nepal is famous. Just flat plains and patches of mist. Within an hour the early cloud breaks and we see the lower foothills of the Himalayas ahead. 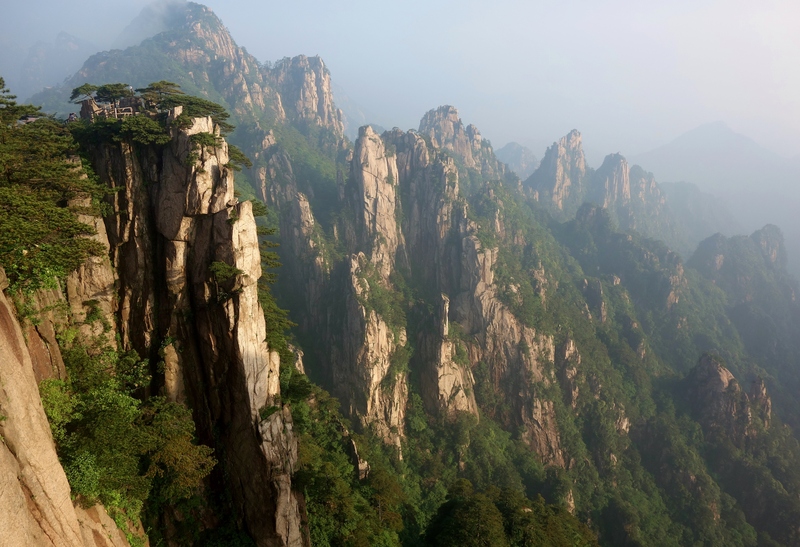 Large forested mountains that rise about a 1000 meters in height. The white giants further to the north are for now hidden. A couple of hours later we connect with the main road that runs between Pokhara and Kathmandu. 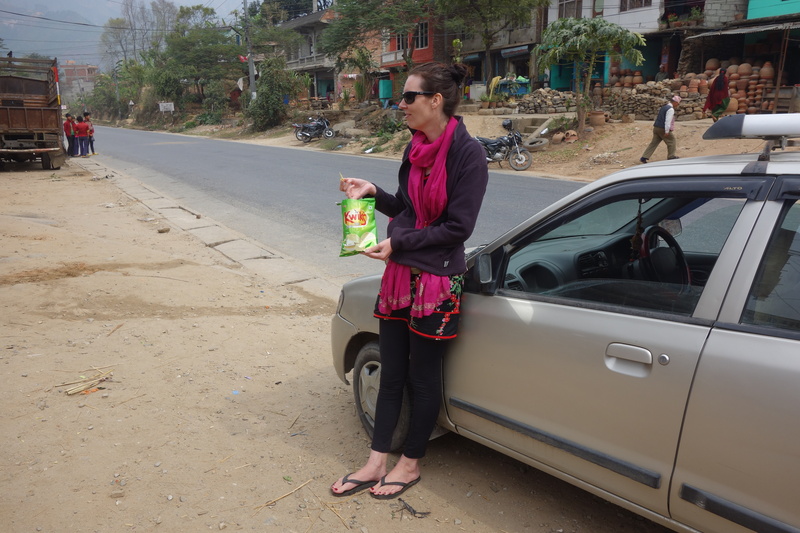 We stop for some food, but opt for a can of soft drink and packet of chips. This seems to have become our staple diet during the day at small and suspect restaurants. My brevity for testing out local food has somewhat diminished knowing that we will start trekking in a few days’ time. 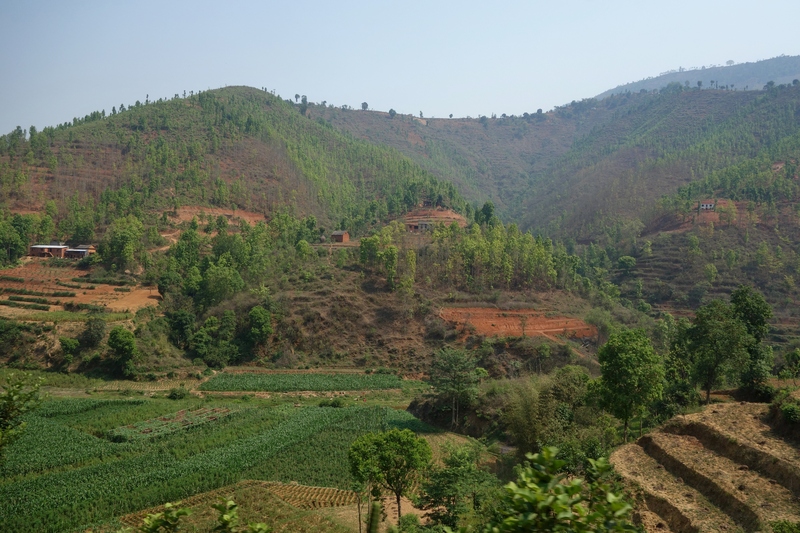 The rolling green hills of Nepal are a visual feast. Lined with terraces and dotted with charming houses and livestock. We start the climb up a long and winding pass. The road degrades into terrible condition. Trucks and busses send up large plumes of dust that force us to close the windows. Overtaking becomes difficult on the narrow broken surface. In the five years since we last came up the pass there has been no improvement at all. This is to use the Indian Businessman’s words a real National disgrace. We snake our way up, overtaking where possible and sometimes where not. The vegetation changes from thick jungle to pine forests. Finally we catch a glimpse of the Himalayas. Among the huge bank of clouds to the north icy tips manage to break through. We crest the pass and Kathmandu comes into view. In the distance I can see a huge Chorten on a hill with a golden peak. True to his word our driver with the jelly bean head has us into Kathmandu within 7 hours of leaving. I feel a little satisfied at least in knowing we passed the busses that left early in the morning a few hours ago.